Alfie slept over again last night. He came a little late, as he had been packed off to the doctors with sticky eyes. I remember when our kids used to get it; we used to have a little tube of Golden Eye ointment to squeeze in. Things are a bit more modern now and Alfie came equipped with his usual bag of stuff and a little bottle of eye drops to put in four times a day…that’ll be fun! When he woke up this morning he looked like Bartimaeus from Bible times. His left eye was completely stuck and his right eye was open just a crack, yet despite this he was able to give us the biggest of smiles. When I came down the lady of the house was giving him his early morning drink. I was dispatched to find cotton wool balls and warm salty water to sort his eyes out in preparation for the drops. My dear one had not forgotten her early training and soon Alfie was looking more his usual handsome self. I’m not sure he was that keen on his drops! We took the good lady off to work, having prepared homemade meatballs in a light tomato sauce and spaghetti for her lunch. When we got home we had a little play together before Alfie went for his morning snooze! He slept for ages, I am not sure whether his eyes had given him a disturbed night, but it was almost eleven o’clock by the time my movements eventually woke him. It was a glorious day, sunny, clear blue skies and not a breath of wind…all this going on while the news was telling me the whole country was on alert for some ark building, as the wind and rain was so bad. Not for us anyway, certainly not on a Friday…Alfie day. 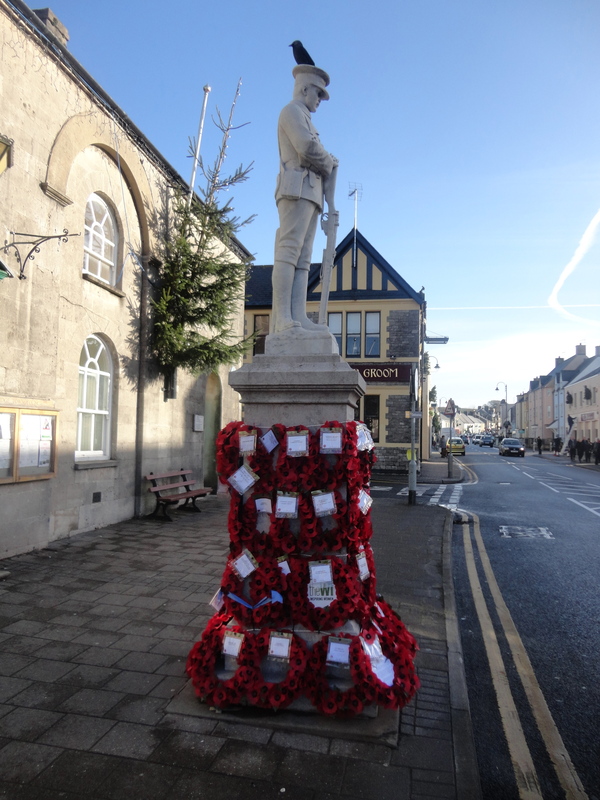 We had decided to go to Cowbridge today as we had been looking for a present to take out to Lesotho and had seen something there some weeks ago and also because it is such a lovely little town, certainly the jewel of The Vale of Glamorgan! The drive down to Cowbridge was stunning, the roads were quiet and the scenery was wonderful. As we drove I was playing Alfie’s favourite CD – the one with all the kids songs on. I avoided … ‘If you’re happy and you know it clap your hands’ in the interests of the other road users! Alfie loved it and danced all the way! 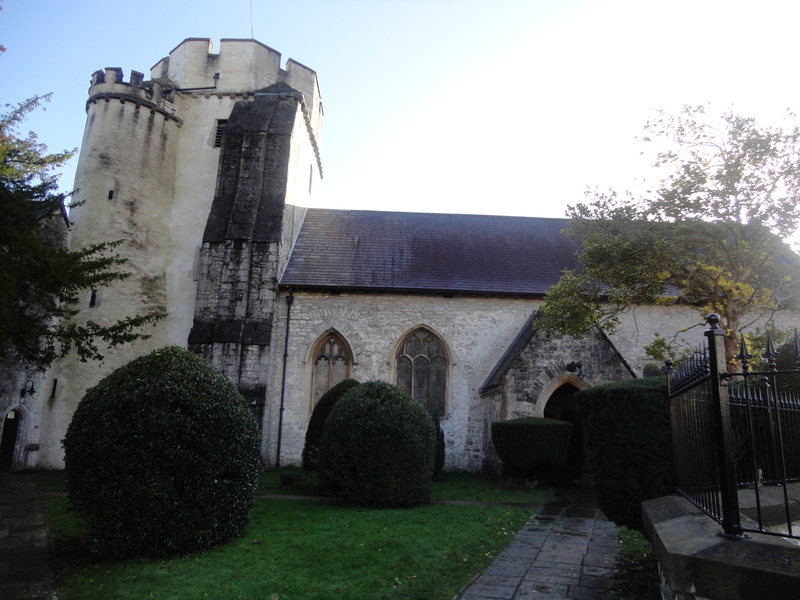 The drive took us through the villages of St Nicholas and Bonvilston, both of which have strong connections with the family of the lady of the house. 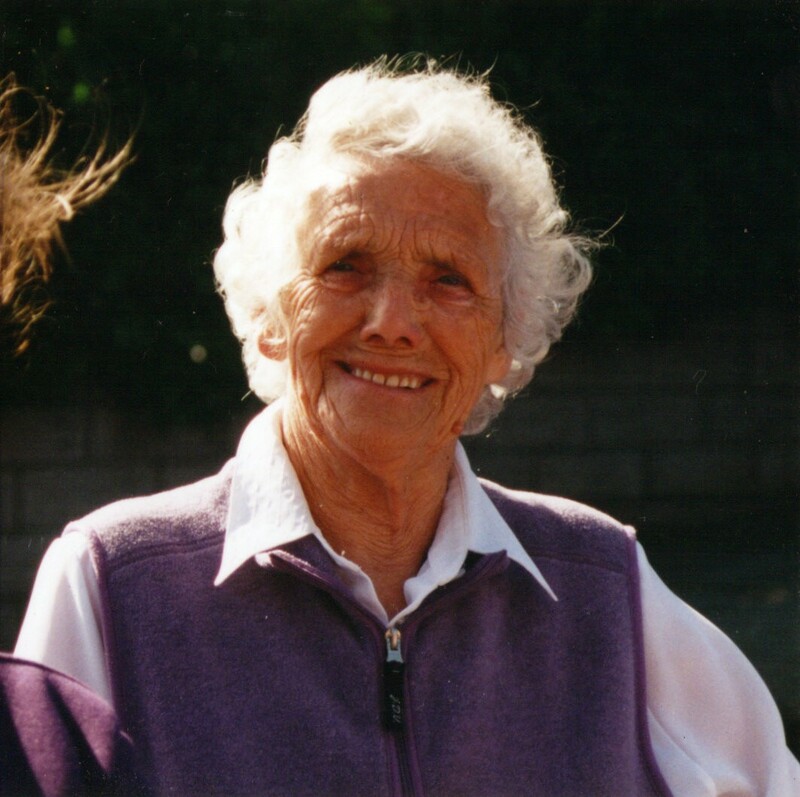 Her mum had spent many happy hours visiting her best friend who lived in St Nicholas and her cousin used to live in a house in Bonvilston; we used to love going there. I was thinking on the way down about the name Cowbridge and wondered how many cows we would see crossing it. I wondered too about the Welsh name for Cowbridge, which is Y Bont Faen- The Stone Bridge. The two didn’t match unless the cows walked over a stone bridge? 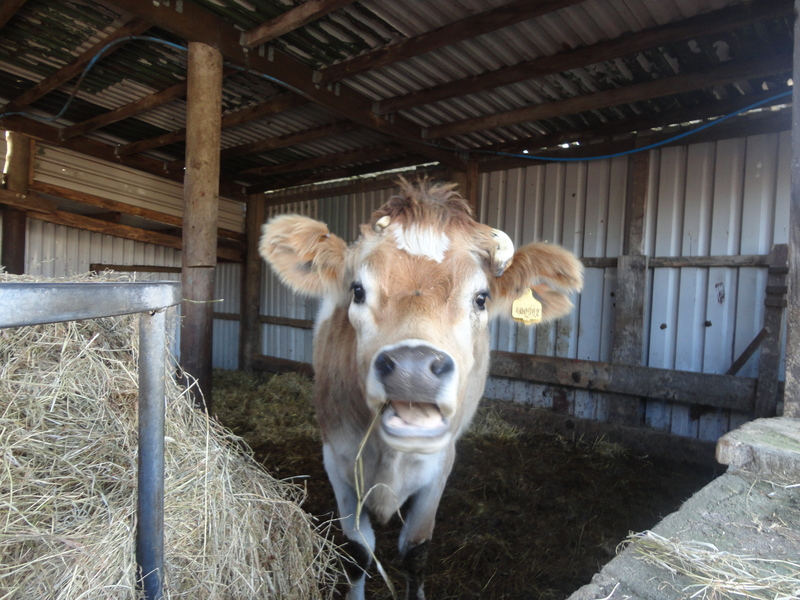 Evidently the town lies on the site of a Roman settlement identified by some scholars as the fort of Bovium (cow-place). Recent excavations have revealed extensive Roman settlement nearby; the town lies alongside a Roman road. There are 17th century references to a ‘cow-bridge’ over a tributary of the River Thaw, which flows through the town. Last time I went there were ducks on the river and I had brought some bread so Alfie and I could feed them. When we arrived it was just like Penarth, nowhere to park! I eventually found a place and we set off. We immediately passed what looked like a good place to stop for lunch. I promised myself that I would remember it if we needed a place to eat. The town is very pleasant and we love walking around looking at all the posh people who lived there. It was quite busy even though it was still school time. Almost every other shop is the kind of shop the lady of the house would steer me into. I can’t help thinking that The Vale of Glamorgan would be better off having Cowbridge as its county town instead of Barry. I noticed that the new Waitrose Supermarket was open and I though I might pop in later. 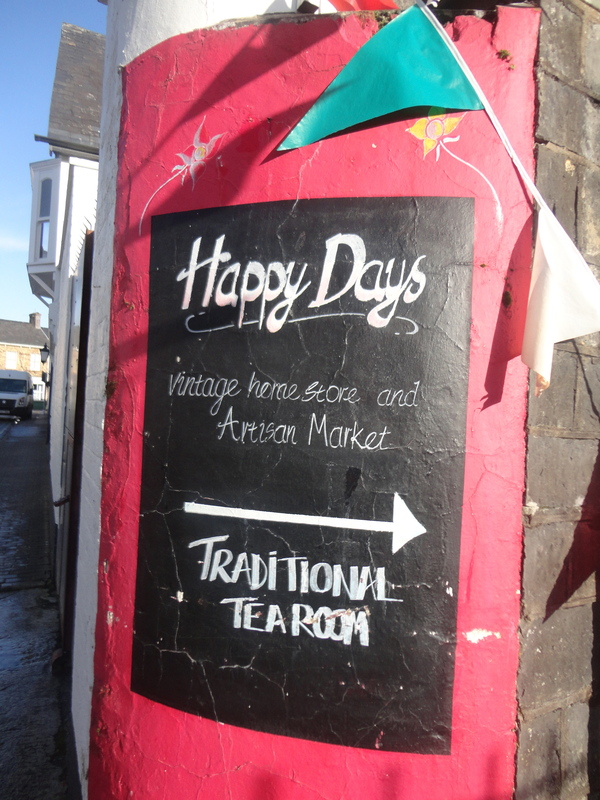 We were making our way to Happy Days, which is a curious mix between a junk shop, a market and a shabby chic emporium. It is a favourite stopping off place for my dear one and me. It has a very good café in there and some really interesting stalls. The café was quiet so we made for it and had lunch while it was quiet. I had made Alfie’s usual… wholemeal sandwiches with grated cheese, a few biscuits and a rice pudding. He LOVED it and charmed every single customer, he really did put on a masterful performance of cuteness…I was very proud, he even had me spellbound! 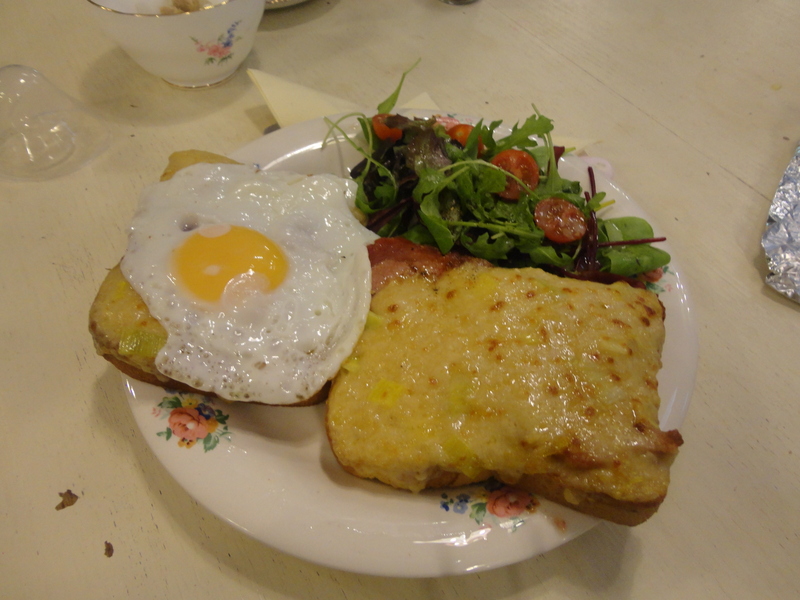 I ordered the most exquisite lunch of a Welsh rarebit with egg and bacon. The rarebit was made with Welsh cheese and leeks! My tea came in a pot (essential) served with a country roses bone china cup and saucer. I was at peace with the world. I promised myself and the café owner that I would visit Trip Advisor upon my return home. I was wishing I had the web address of Ramblings so I could tell him his establishment would soon be famous! We had a lovely relaxing time together and then moved on. Next door to Happy days was an old church where they were holding a Christmas Tree Festival. I walked in and it was truly wonderful. there were loads of different Christmas trees all around the church, put there by local organisations and charities. I would have loved a look around but an old bird on the door asked me for £3 entrance fee and I had only just about managed to find enough loose change for my rarebit so I had to pass…I will visit some other time. We walked on and passed a rather impressive Tenovus Cancer Charity shop. I couldn’t believe the quality of the stock. Mostly M & S stuff… I must say, the people in Cowbridge throw away some good quality clothes. Annoyingly, there was nothing I fancied so we reluctantly left. We made our way to Waitrose, as I had made my mind up to buy some Manuka Honey. I thought there had been a pricing error when I saw the price tag, but I bought one anyway, people do speak very highly of it! Next we went to feed the ducks but they were nowhere to be seen, Alfie looked sad. I was thinking perhaps the good people of Cowbridge like duck instead of turkey for Christmas and word had got to them and they had sought a different watering hole till the festive season had passed. Such is life! 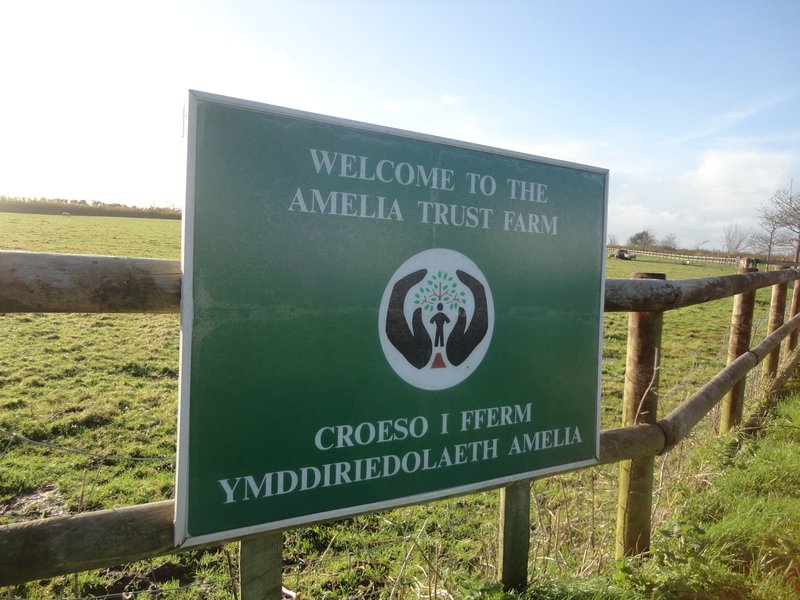 We had decided to go home via The Amelia Trust Farm, which is just off the Cowbridge Road near Bonvilston. Halfway there Alfie fell asleep. He woke up as we pulled into the car park and he gave me a tired smile. 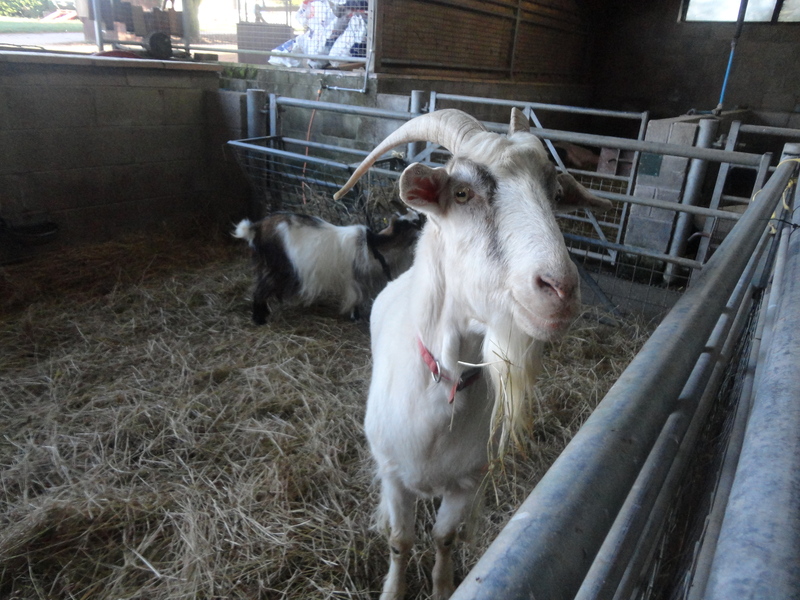 He started to enjoy the animals, especially the goats and the cows but as we got near the pigs I was surprised to hear the strange noise they were making only to discover it wasn’t the pigs it was Alfie snoring. 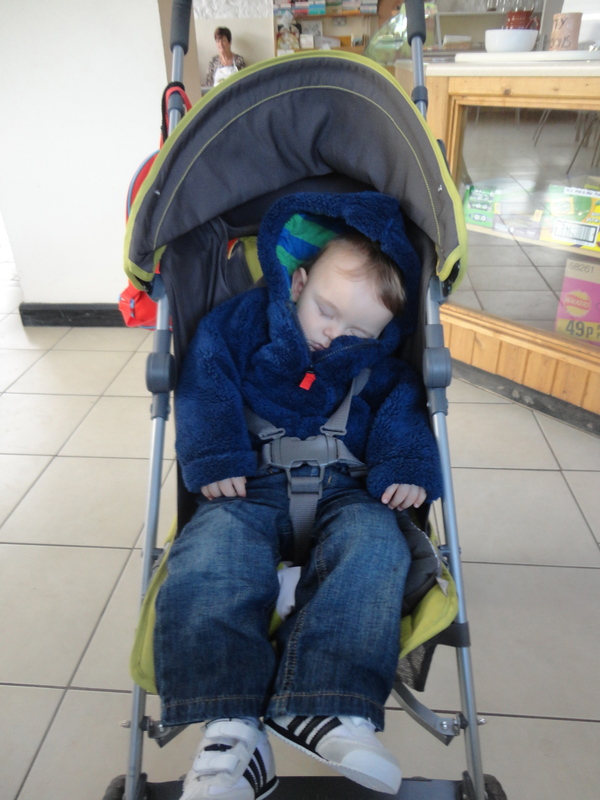 I carried on for a bit thinking the fresh air would do the little man good, but when I called into the café, he was sound asleep. I had a cup of coffee and turned the stroller round so I could just watch him. I quietly promised him I would come back here another day on another adventure. Looking at him just reminded me how much I love this little fellow. I looked at the airport in the distance. How I loved going there when I was a kid, my dad often took me to watch the planes, jetting off to places far and near. Sadly now it’s quite hard to see a plane landing at our main airport and annoyingly, the airport is arranged in such a way that you are unable to see the planes anyway once you are there. The drive home was a quiet one with Alfie asleep all the way. He failed to wake up when I lifted him into the cot. It had been a lovely day out. I can’t believe how quickly a day can go by. Alfie woke up soon after and we had a little play before his dad arrived. I was sad as he left, as I will not have another adventure for two whole weeks! I sat down and waited for the arrival of another tasty rarebit…the lady of the house was due home shortly. Thanks buddy for another great day! Several months ago, Mia and Millie’s parents asked us if we could have them for a long weekend. The lady of the house and I thought long and hard for all of half a second before agreeing. Nothing beats a weekend with our ‘girls’. Seems like the loving parents were off on a Newberry Tours trip to see The Northern Lights in Iceland. At first the dear lady who shares my life was a bit put out that she hadn’t been invited on the trip but when came to the crunch, it was a choice between The Northern Lights or sharing a weekend with the two precious little ones that are the Light of our Lives…it was a no contest. We looked forward to it enormously! We had been into the Cath Kidston shop earlier in the week and bought a whole load of stuff to give away as presents to all those who came. 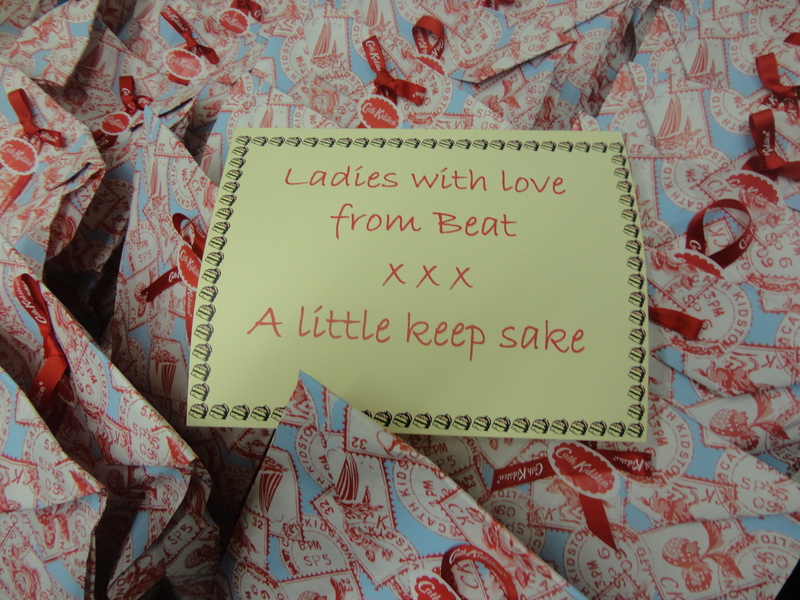 It was such a lovely idea and on the day all the ladies and gents who turned up went home with a little goody bag from the grand old lady herself. Everyone was thrilled! 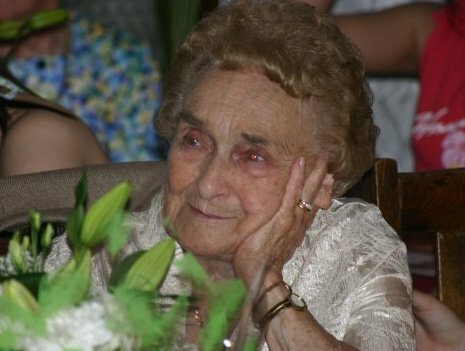 That little party was our way of not just telling a dear, sweet, old lady, but showing her too that she is loved. We will have no regrets when she leaves us. We told her then, as we tell her every time we see her….that she is loved. Surely there is no greater feeling in the world than to know you are loved! 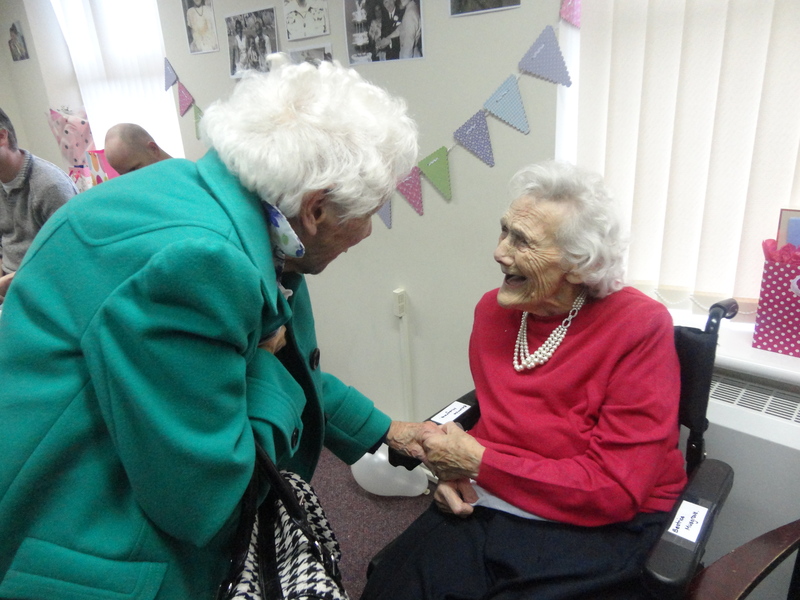 The party had many benefits and some things we will treasure forever, the look of sheer joy on Beat’s face when she realised her sister Grace was with her, the meeting of the generations of the Bateman/Musgrove families…. from Millie all through to the great lady herself and people seeing each other after years of being out of touch. It was a good day… a very good day. After the party had finished and the parents shipped off to Iceland we settled down to enjoy a great weekend together. We had a chilling session on Saturday evening and just enjoyed each other’s company, watching my new favourite film ‘Up’. Mia decided that she wanted to sleep with her Nan so I was promptly dispatched to the nursery to sleep in the princess bed to ‘watch’ over Millie while the girls climbed the wooden hill to the land of Nod. 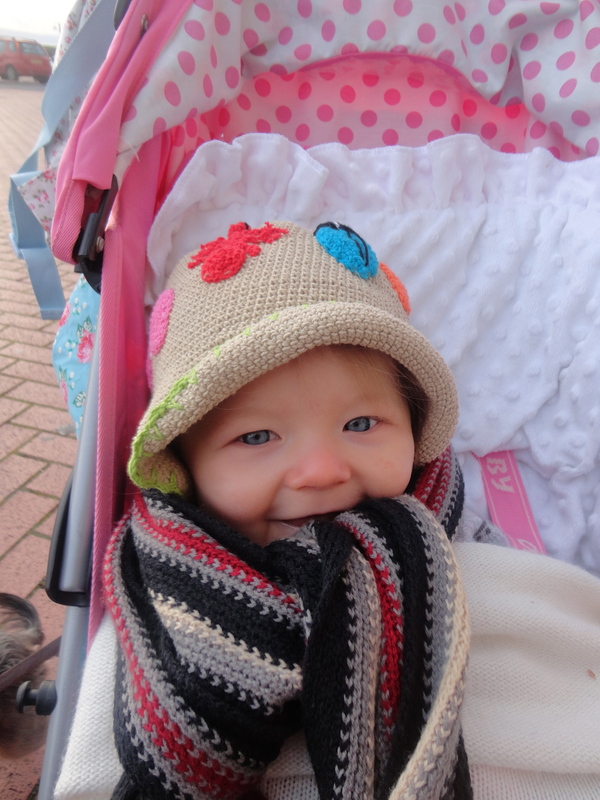 Sadly, Millie slept perfectly all night and there were no little midnight cuddles on offer. But the next morning she was raring to go. Seeing that beautiful little face and those blue eyes smiling at me was just the best way to start the day. Millie has the ability to smile, not only with her face but also with her eyes. She is such a treasure. We had breakfast together and I was due to address a church in Newport, so we decided to do something special in the afternoon. 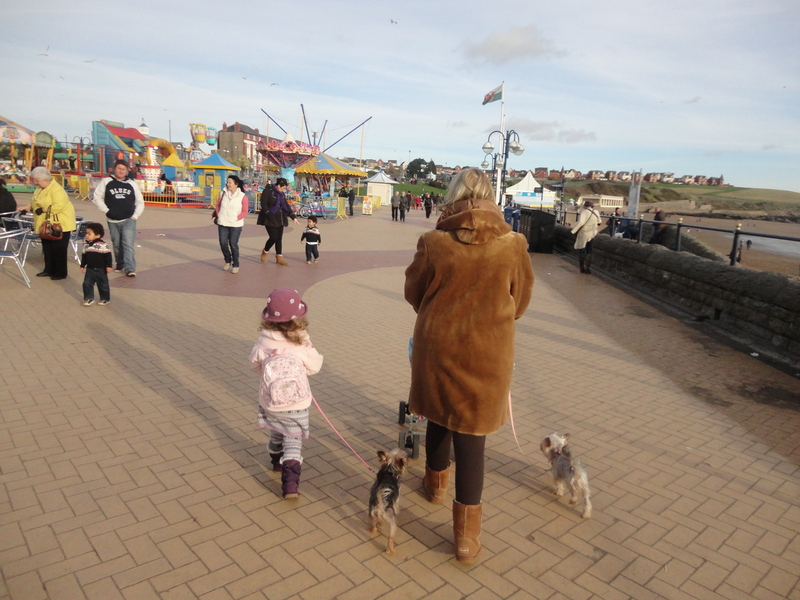 So a trip to Barry Island it was at lunchtime, to take Yappie and Scrappie the two little pests the lady of the house calls her ‘girls’ for a long overdue walk. Most people would describe these tiny living creatures as dogs but not my dear one… they are only ever ‘girls’…and yes for those who were thinking…they DO have a Cath Kidston dog bed…nothing but the best…. Mia loved holding the lead despite us getting tangled up quite often. We had the obligatory photo shoot outside Marcos Coffee shop, and the guy I asked to do the shooting offered to take us on the whole Gavin and Stacey tour…but we declined. 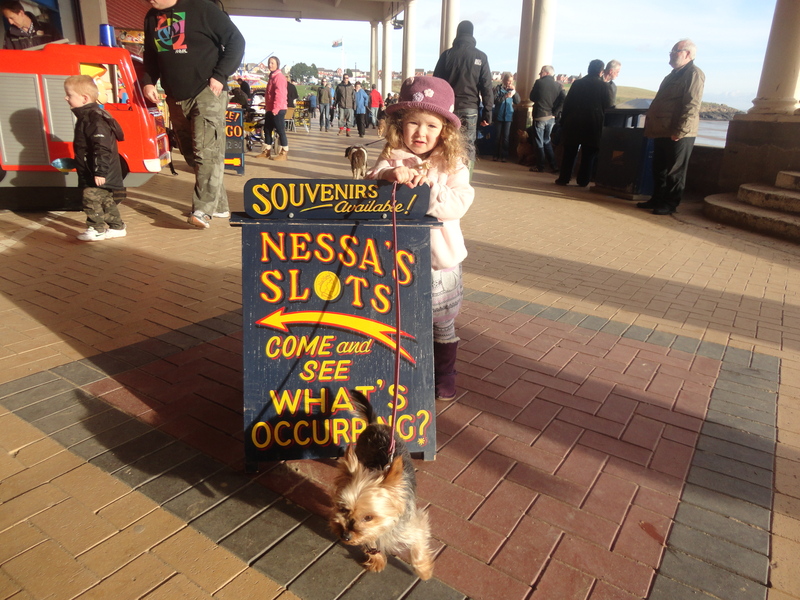 As we walked around we had trouble keeping Mia out of Nessa’s Slots, an amusement arcade, whose bright flashing lights invited all passers by to come in and waste their money! 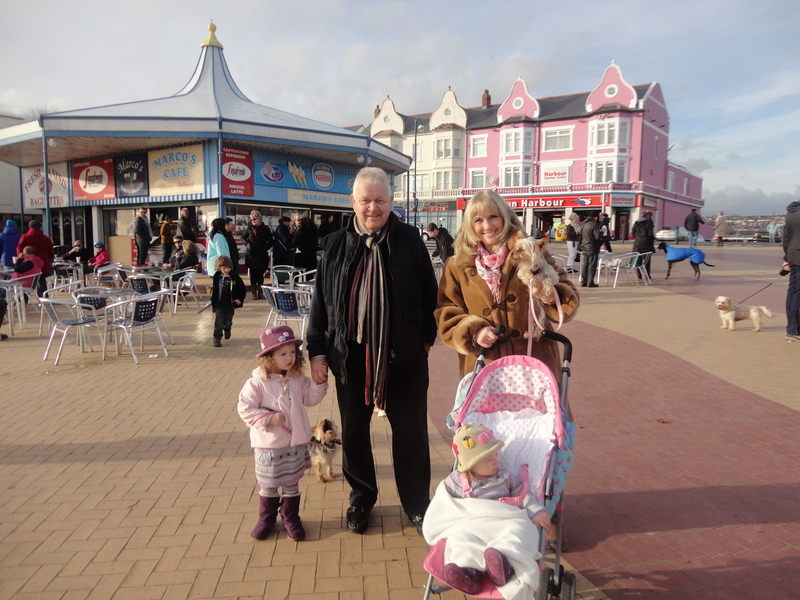 We walked round and had a delightful time, Millie was watching the world go by from the security of the Barbie puschair still warm from Friday’s Adventures with Alfie and it so much more suited the little darling that was Millie. Mia walked with us chatting away and enjoying our company. We walked along the promenade and passed hundreds of dogs. From September to March dogs are allowed to run free on the beach and many people take advantage of it. We passed one mean looking Staffordshire Bull Terrier who was eyeing up Yappie and Scrappie as I would eye up a large fresh cream doughnut. I was very tempted at first, but looked across at the love of my life and thought better of it and gently pulled them away from the Staff’s salivating jaws. I did mention to the Staff’s owner that her dog looked like it was expecting a snack and she just smiled. Did you know that Yorkie’s are the only dog that can kill a Staffordshire Bull Terrier…apparently they get stuck in their throat! As we walked back passed the decaying fun fare we though it would be nice to have a treat and have lunch in Barry. Good move! 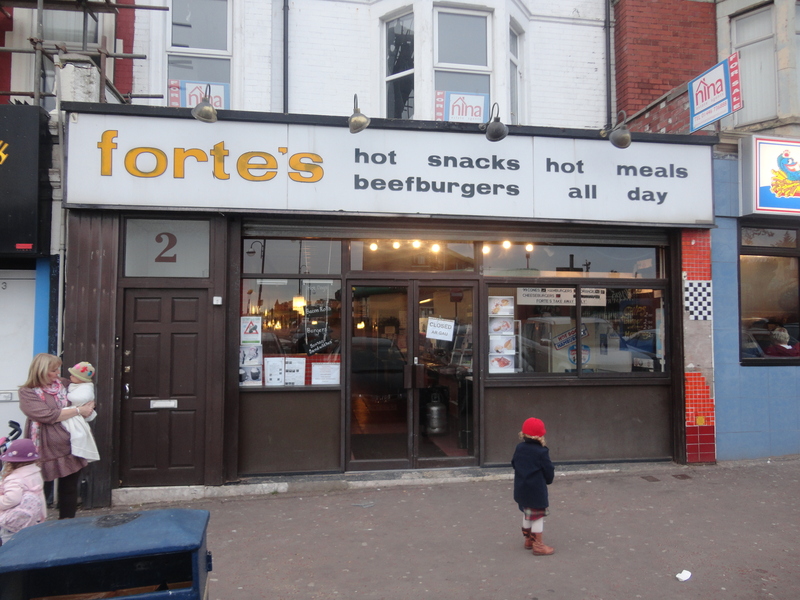 We passed a few Burger Bars and fish and chip shops and also had a little look in Big Dave’s, but the sight of Forte’s further down the road made up our minds. When the good lady and I were first married Forte’s was the place to go. They served frothy coffee before the world had heard of cappuccino, latte and Americano. 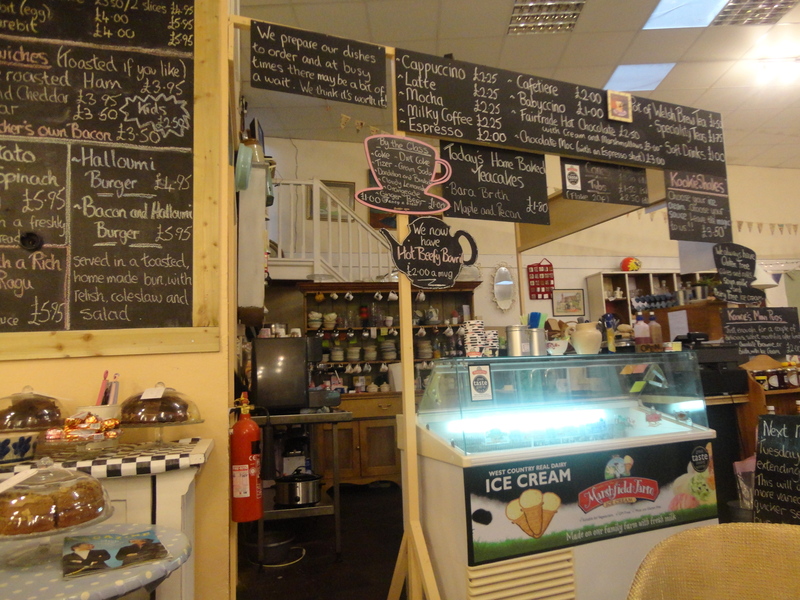 Forte’s was up and running when Starbucks and Costa Coffee were just a mere twinkle in some entrepreneur’s eyes. We made our way in and found ourselves in a fifties time warp. The place looked like the inside of a set from Happy Days… without the lights. We settled in and ordered tea, which came in Pyrex, cups with odd saucers. The good lady ordered a Clarks Pie and chips. I looked at her adoringly and was so glad I had married such a fine person…Clarks Pie and chips, obviously a lady of good breeding! I went for Cod and Chips and Mia ordered Egg and Chips. Life was good. A Calor gas fire burned happily in the corner near our table. Then came the bad news – we were told they had run out of Clark’s pies. Oh dear. Did you know that a stare from my good lady can turn a waitress to stone? The one in Fortes in Barry does! While our food was being lovingly prepared I went across the road to draw out some cash. You could tell it was a Barry cashpoint as the machine was issuing fivers. When I got back the food was waiting…on Pyrex plates. We smiled… the food was good, Millie had already eaten her lamb dinner and fruit pot and Mia enjoyed her egg and chips and we soon found ourselves walking out. As we did so I gazed up at the sign I felt sure when Forte’s left they forgot to take their sign. I later checked on Trip Advisor and it has two positive comments… it was very dated but we loved it! 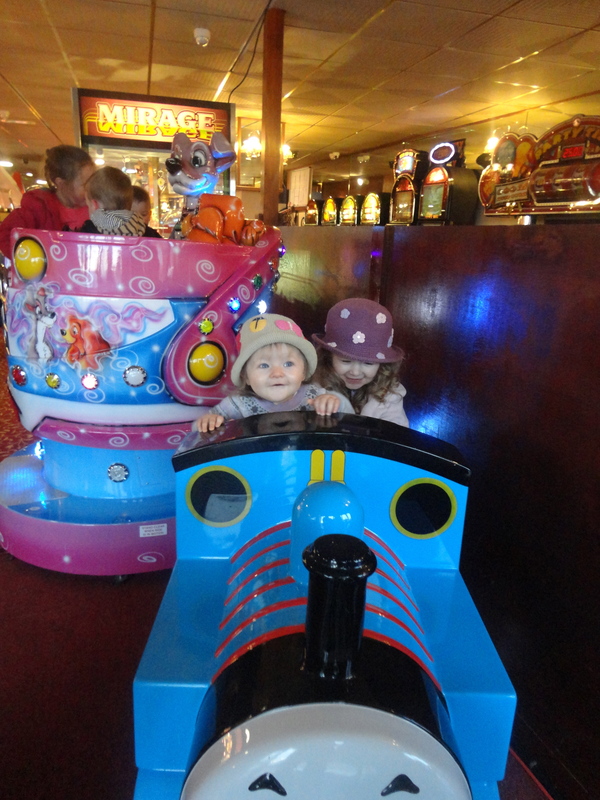 On the way back to the car we gave the girlies a go on Thomas the Tank engine… it was fun! While we had been eating Yappie and Scrappie had been locked away in the boot of our car and I suddenly wondered if when we got back to the vehicle, the boys in blue would be surrounding the car with some RSPCA officers; but they had been quiet and not ripped each other to shreds. We drove home tired but happy the girls fast asleep in the back. They missed church but woke up in time to visit Uncle Gareth and Aunty Mercedes in Millbrook Heights. The lady of the house had arranged a visit to talk through her mum’s party and give Millie and Mia a chance to get to know their relatives a bit better. We all had a lovely time. 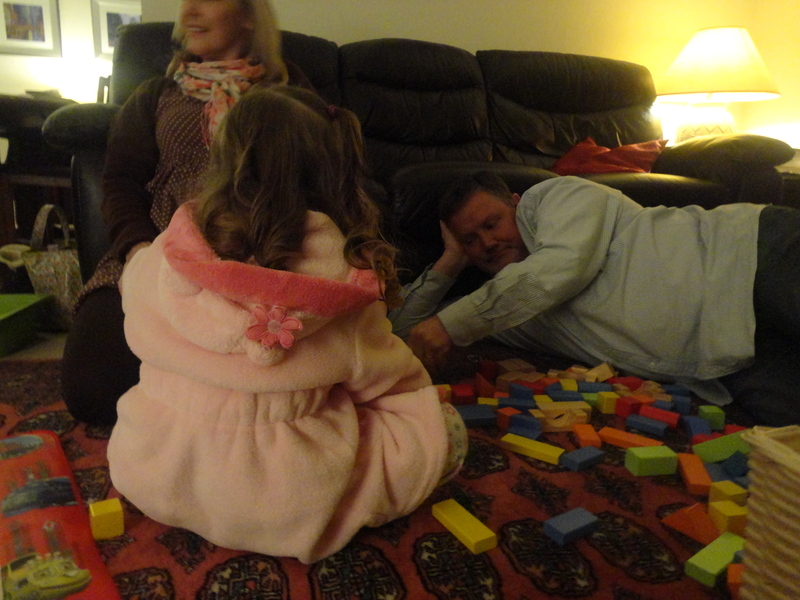 Mia and Millie played happily with Uncle Gareth who is brilliant with little ones and an expert toy builder with a first class honours degree in Lego. Mercedes looked after us really well and we even watched the video of Beat’s Best Bits of her ninety years on the planet. We had a beautiful time. It had been such a great day. Things returned to normal at home and my dearest one slept in the nursery watching over Millie and Mia slept with Aunt Bes. I was upstairs snoring only to myself! 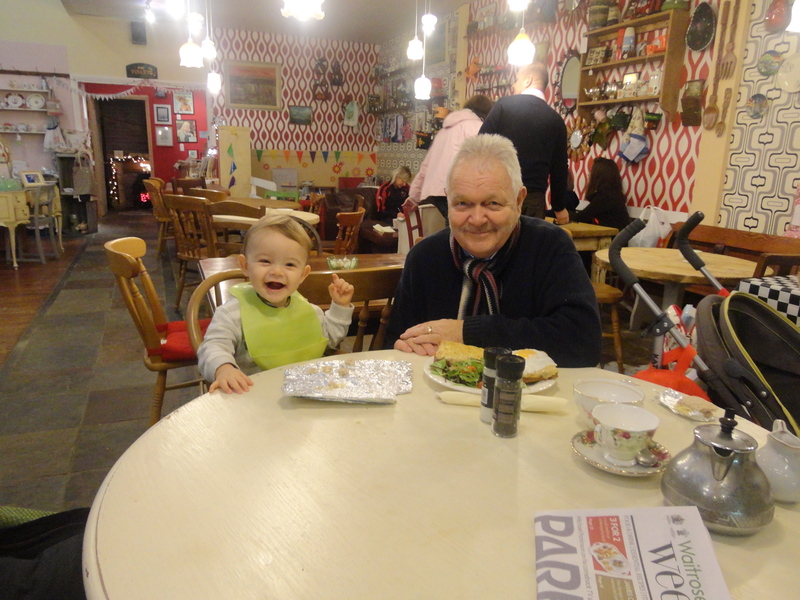 Monday was the day we had to pass on the care of these two precious bundles of fun to Nanny and Bampa, but on the way we called into Alfie’s for a play and some quality time together. It was such a great time, our three precious little ones having fun together. We watched them with great pride and gratitude. It was a good way to end our weekend and we are saving up now to send Mia’s and Millie’s parents off somewhere else… so we can enjoy them again. 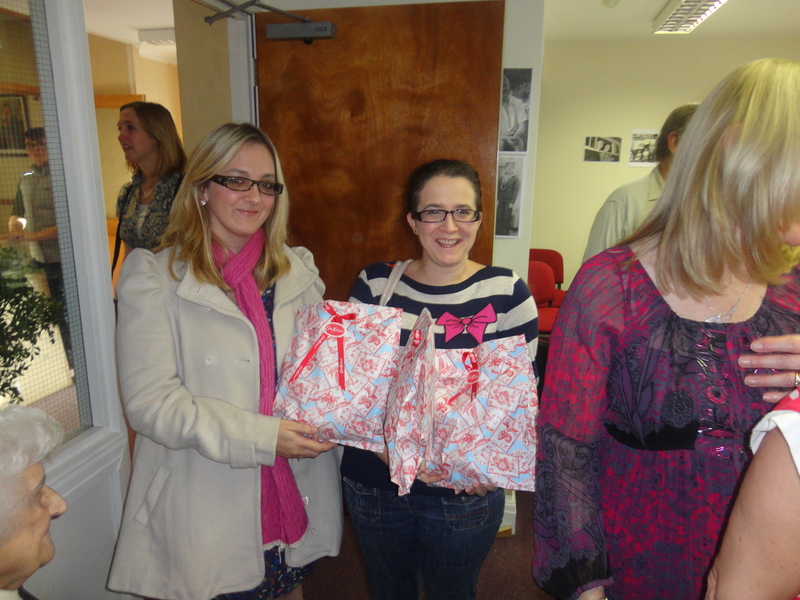 Thanks girls…you are both so special. Mia, Millie and Alfie have been born into a family where they are loved, just like millions of other children are around the world. Watching them grow is an amazing experience. Sharing with them about life is an awesome responsibility, teaching them God’s ways and His truths is extremely important to Boo and myself. Much of what we have learnt about life was given to us by our beloved parents. While Mia, Millie and Alfie will never know them personally, we are committed to passing on the important things our parents shared with us. They were incredible people. Sir Isaac Newton is credited with a phrase which has had a big impact on my life ‘Standing on the shoulders of giants’ in which he gives credit to those who have gone before. Newton didn’t originate it though. The 12th century theologian and author John of Salisbury used a version of the phrase in a treatise on logic called Metalogicon, written in Latin in 1159. This so makes me think of the impact our parents had on our lives. Mia, Millie and Alfie will, I trust, get to know much about them as they grow, and we will pass on to them what our parents passed on to us. This is the commandment that God, your God, commanded me to teach you to live out in the land. This is so that you’ll live in deep reverence before God lifelong, observing all his rules and regulations that I’m commanding you, you and your children and your grandchildren, living good long lives. Do what you’re told so that you’ll have a good life, a life of abundance and bounty, just as God promised. Write these commandments that I’ve given you today on your hearts. Get them inside of you and then get them inside your children. Talk about them wherever you are, sitting at home or walking in the street; talk about them from the time you get up in the morning to when you fall into bed at night. 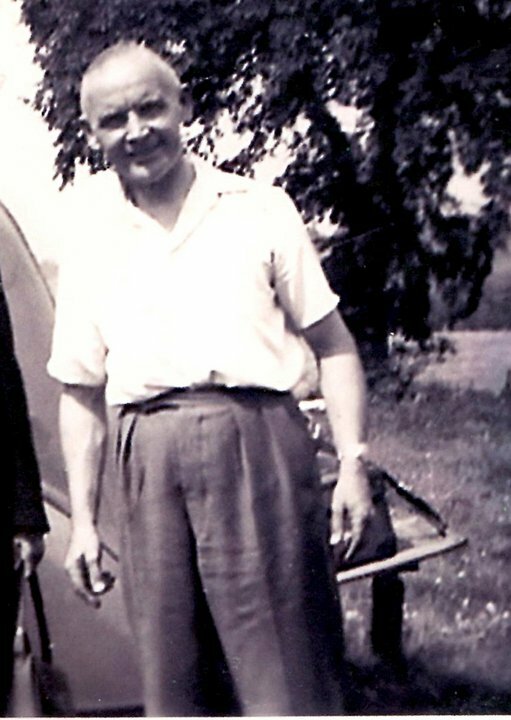 Alfie will never know his great grandfather Jack personally, yet he will learn much about him as he grows. 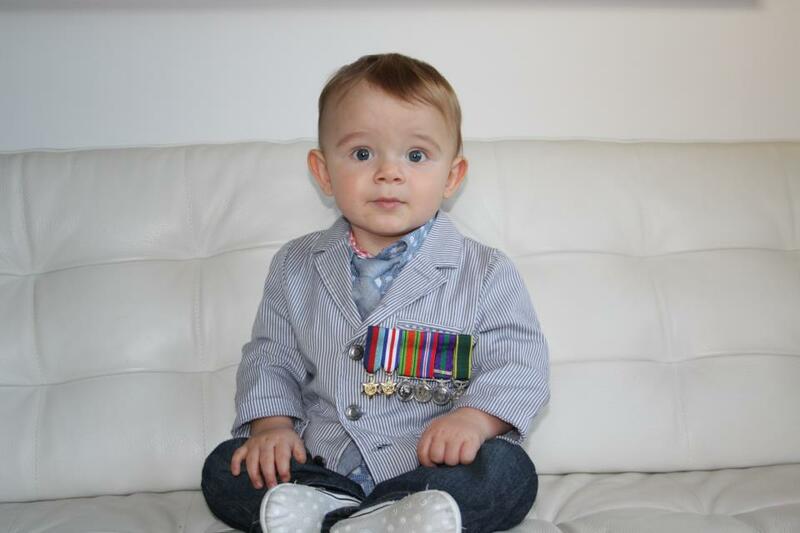 This picture shows Alfie wearing a miniature set of his great grandfather’s World War Two medals. 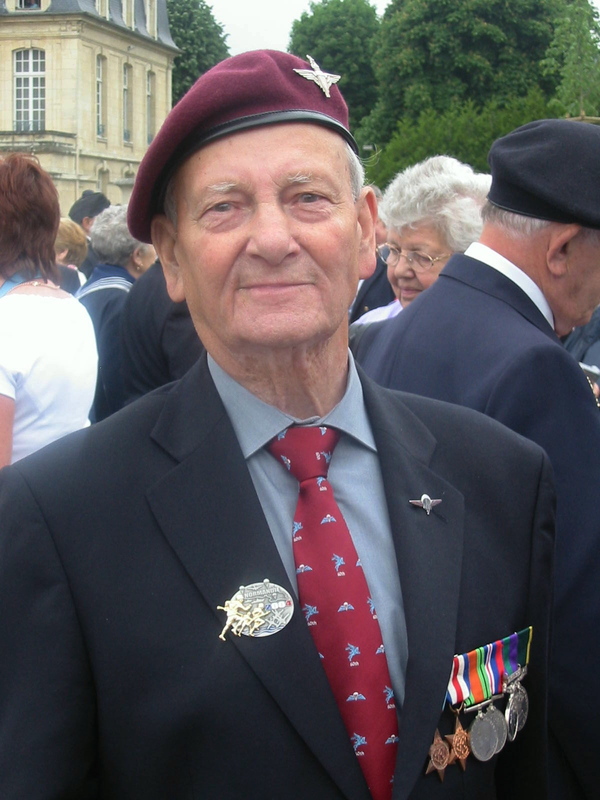 He wore them for the first time on Remembrance Sunday 2012. I hate November or at least I used to hate it…grey days, clocks just gone back and the Spring as far away as it can be. I am sure I suffer from that horrible disease one gets when one lacks sunshine. After the shocking summer, I am even beginning to believe my niece who is championing the fact that the government is spraying the atmosphere with chemi trails to cause more cloud and rain cover to counteract the effects of global warming. 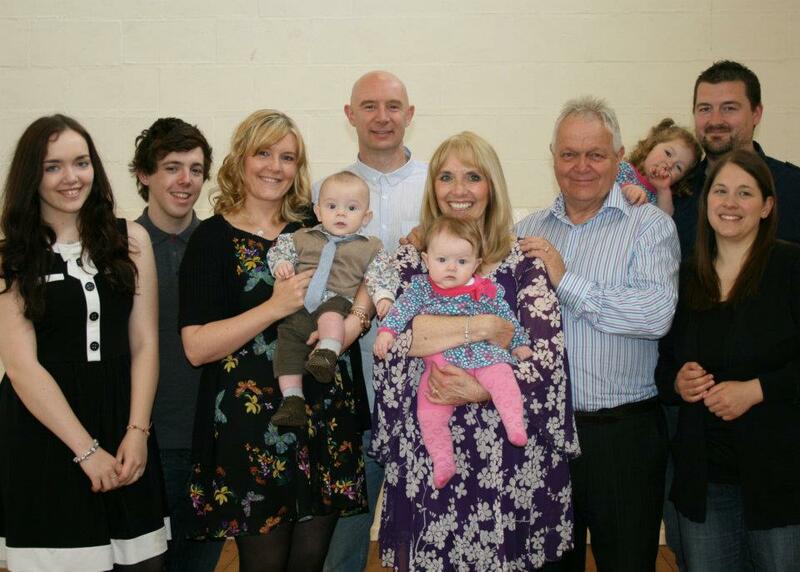 This year though there is a ray of sunshine in my life and it’s called grandchildren. We see a lot of ours thankfully. Mia and Millie are frequent visitors to our place and we have the wonderful prospect of having them staying this weekend. 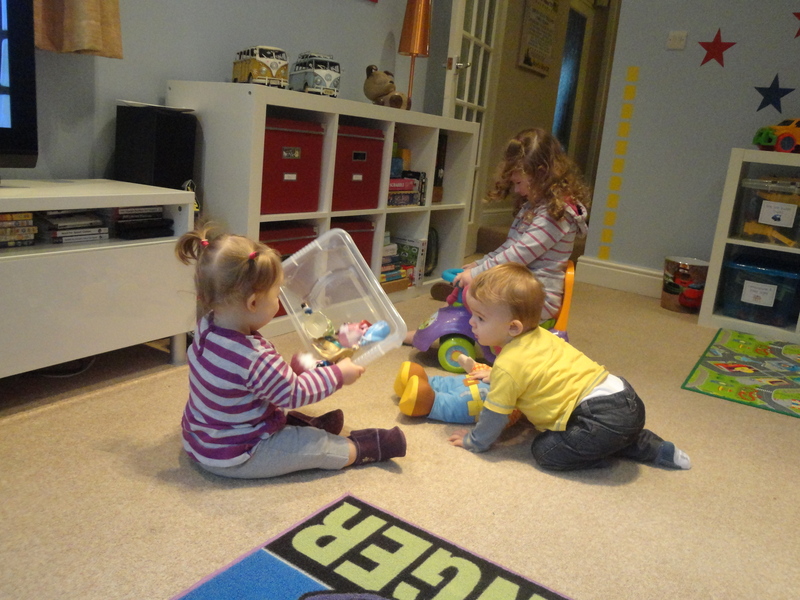 They are beautiful little treasuries and the other little ray of sunshine is Alfie who I look after every Friday. 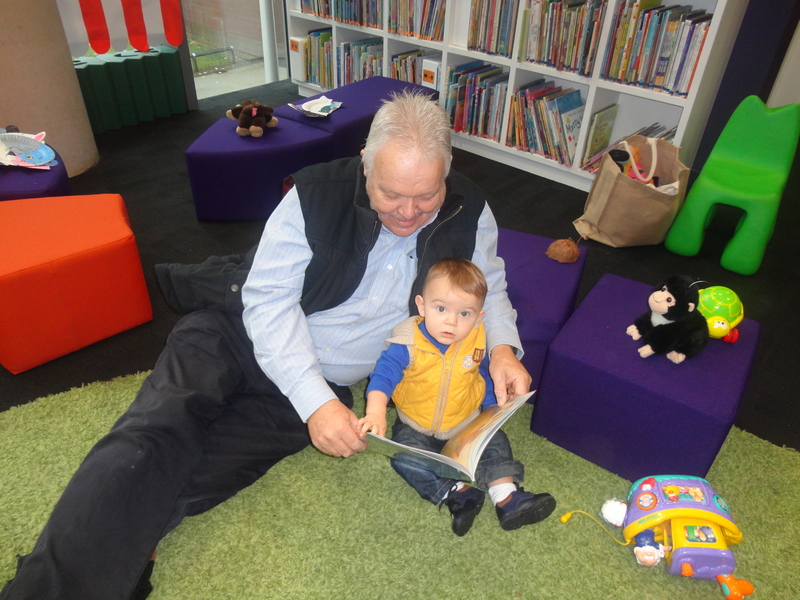 I had already made my mind up that today I would continue Alfie’s education with a visit to the library in Cardiff. When I saw the fine drizzle, which covered Wales this morning I knew I had made the right decision! Alfie slept over as usual and very kindly that lady of the house had been up early bathing, dressing and feeding the little fella so when I blearily made my way down stairs to prepare the good lady’s first meal of the day and prepare her second one as well, he was ready, smiling and ready to go adventuring. Being with this little man has changed me. Went to town with Alfie. When the lady of the house was safely out of harms way Alfie and I drove back home. We noticed that the traffic is always much lighter on a Friday. A lot of my friends ‘work from home’ on a Friday….so they say!!! I used to ask my headteacher if I could work from home from time to time and he always said the same…”No! You’ll never get thirty kids in your lounge Fatboy!’ and so in the end I gave up. I am still a little envious of those who are able to ‘work’ (term used very loosely) from home. Never mind life is tough sometimes! When we got home we had a little play. After playing ‘farms’ last week we played ‘kitchens’ this week. 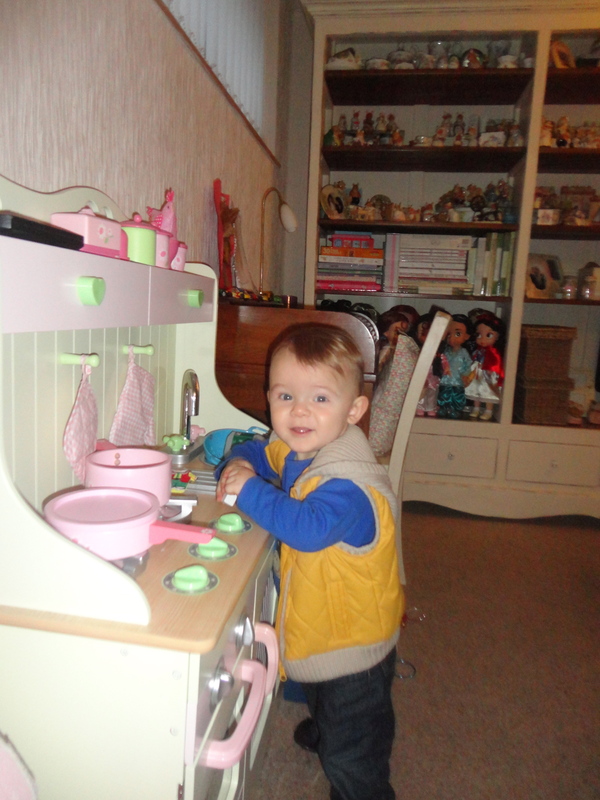 Alfie had a little go pretending he was Heston Blumental. The kitchen is a bit pink, but Alfie appears not to notice too much. He made me a delicious cup of tea and had a little go at a few simple recipes, before going off for his nine o’clock nap at more or less the right time…that seems such a good idea. He went straight down…good little fella! I looked in the mirror and was truly shocked…what a mess, messed up hair, face sporting a rubbish MOVEMBER moustache, bags under my bloodshot eyes, looking like they are packed for a 6 month holiday and when I yawned my breath offended me! I was about to do the dishes, but I thought a bit of personal hygiene was long overdue. I checked Alfie, he was sleeping peacefully, so I decided shower first and do the dishes afterwards! Job done and now looking decidedly more handsome and debonair, I looked around for something to wear. I noticed that Alfie was wearing his gillet and as I had just bought one for myself from the few pennies the lady of the house had given me for my birthday, I thought we could go as the ‘Gillet brothers’. I am never sure how to pronounce the word… Is it gillet ( gi…as in what you say to horses to make them go and …llet as in café au lait) or is it gillet (gill..what a fish breathes through and let, rhymes with net)? You can choose but I’m saying gillet. Alfie woke in good time to go for the 10.28 train and we made our way to Eastbrook Station. When I was there something happened which made me Iaugh out loud. All of a sudden a posh sounding bird announced that the next train to arrive at Platform One was the 10.28 to Cardiff Central and then apologised that it was not expected to arrive until 10.32. Three things…. firstly, since when has Eastbrook Station had a Platform One…secondly, since when has Eatbrook Station had a station announcer and where has she hiding? Thirdly, how did she know the train was four minutes late? Brilliant…The train actually came at 10.30 but I didn’t have the heart to tell her. 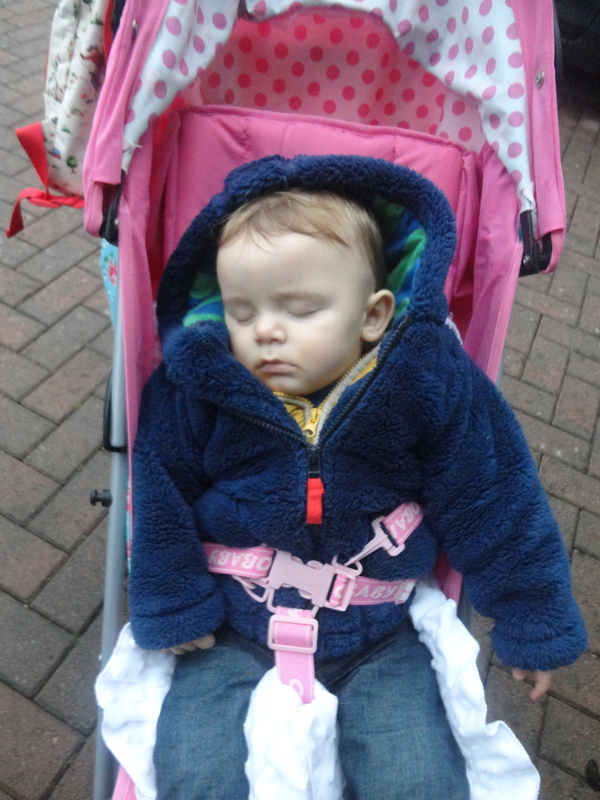 It was quite busy so Alfie had to stay in his pushchair much to his embarrassment! Alfie’s parents often forget we only possess a Barbie pushchair and when they forget to leave their stroller this manly little one year old has to spend the day pretending to be Barbie’s boyfriend Ken! 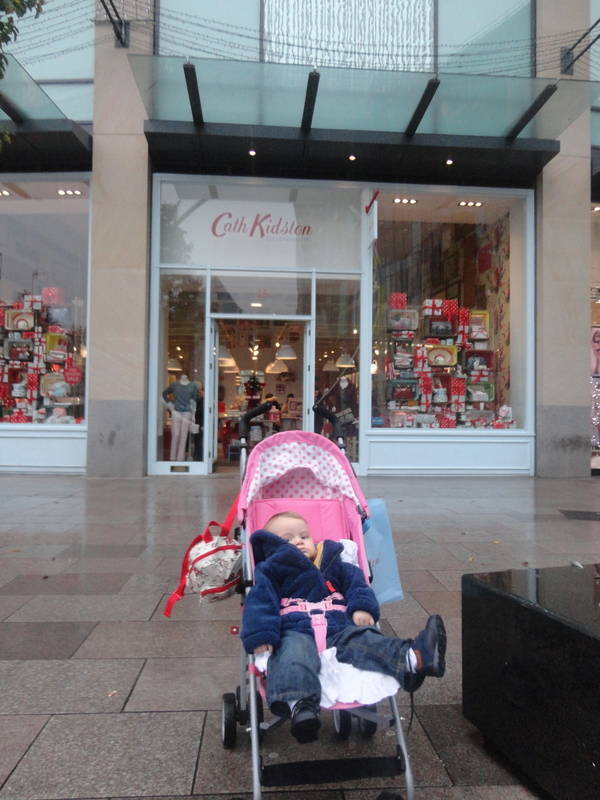 Oh the shame… but he seems to cope OK.
We arrived in Cardiff and made our way to the library, but first we had to stop off at the Cath Kidston shop to exchange some presents that we had bought for Alfie’s great nan’s 90th birthday. As I walked in through the door I noticed that this busy town centre store has almost as much Cath Kidston stuff as the good lady, who shares my life, has in our house! Many people don’t know the existence of Cath Kidston, Dinas Powys. I was having the best time ever… so was my little buddy! I noticed thought that several ladies were peeping down the back of their little darling’s nappies, then shaking their heads and looking straight at Alfie. I got the message. 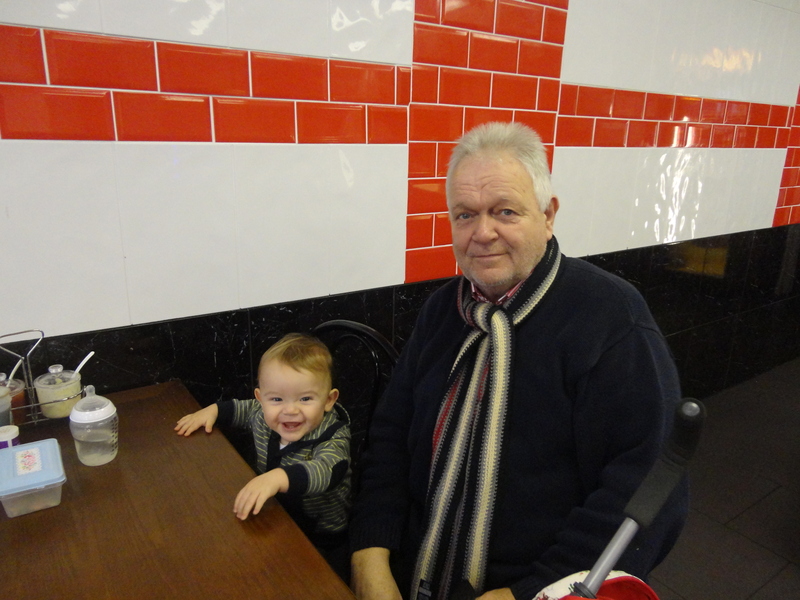 No worries though; this little piece of heaven in our city centre had been thoughtful enough to provide a ‘grampy and toddler’ changing room, I did the business ( and so had Alfie…big time) and rejoined the group. Most had gone home when we reappeared. 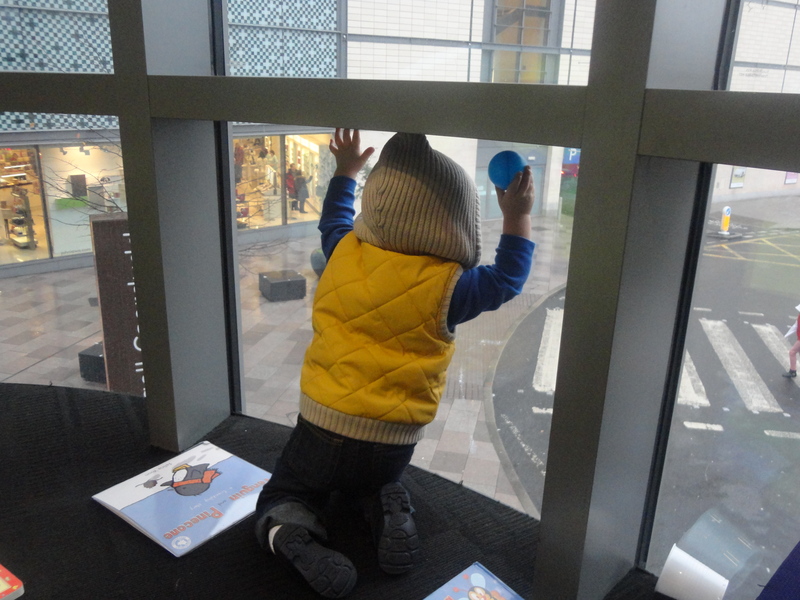 This gave Alfie the chance to explore a bit more and he found the windows, which reached, down to the floor. 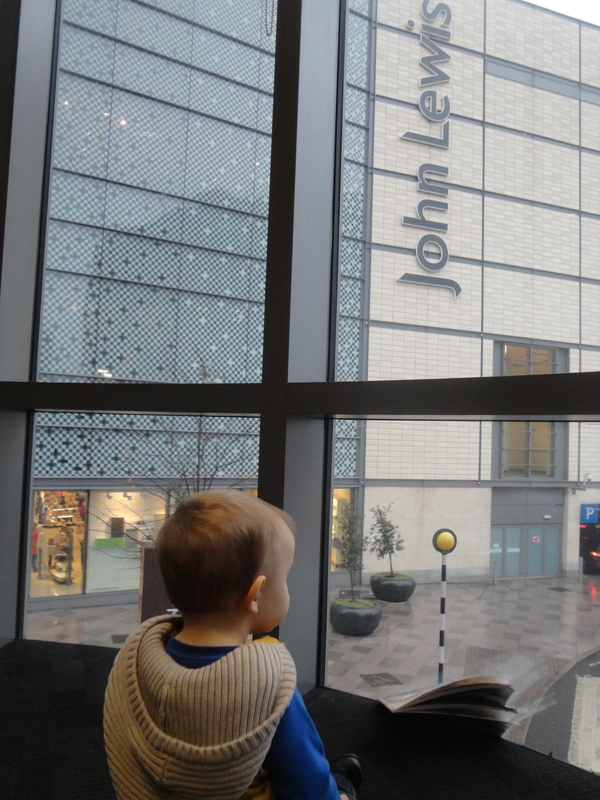 He loved this even more than the toys and books and sat for ages and ages looking out on to the entrance to the John Lewis car park. 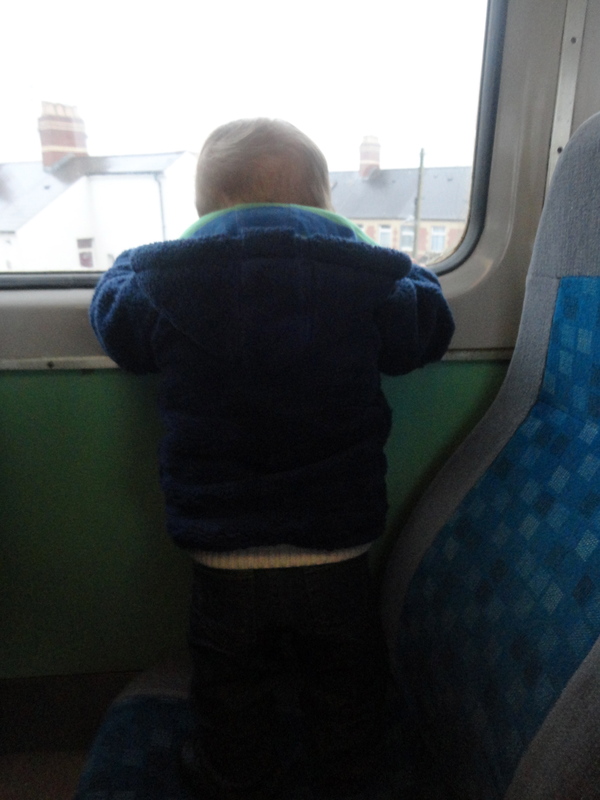 He loved looking at the people car and buses going past it was great! We could have stayed there till teatime but a library helper started tidying up and it was dinnertime anyway. After chatting to the assistant and finding out about next week’s story time and rhyme time – Mia and Millie get ready…you are coming next week – we made our way out. 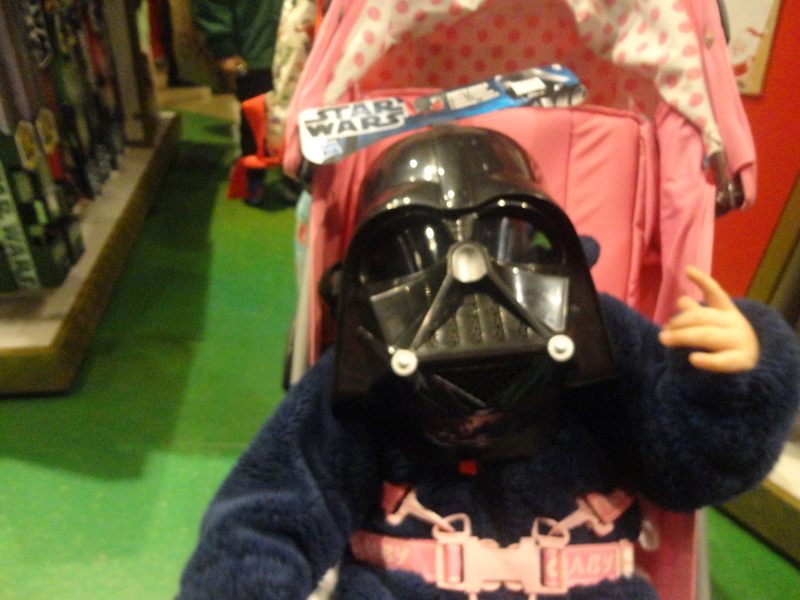 We thought we would visit Hamleys before lunch. 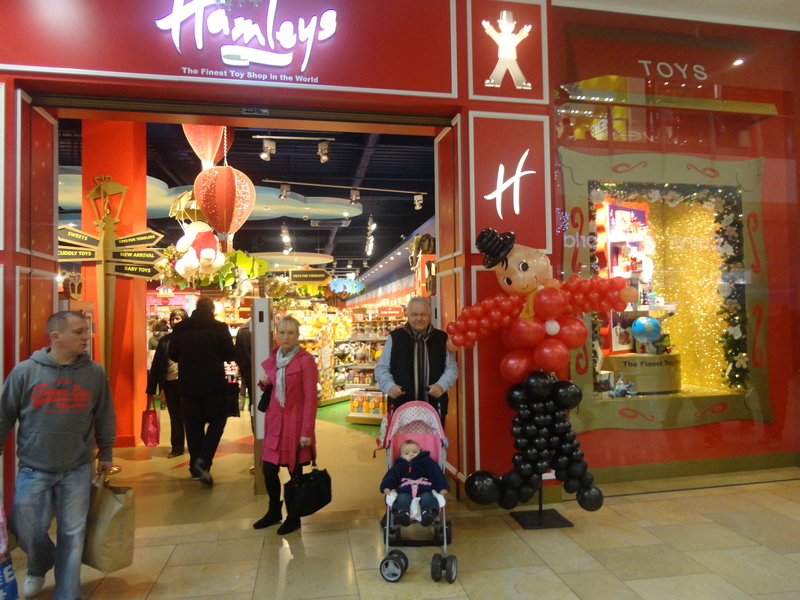 I have only ever seen one other Hamleys in Regent Street in London, but now we have one in Cardiff. 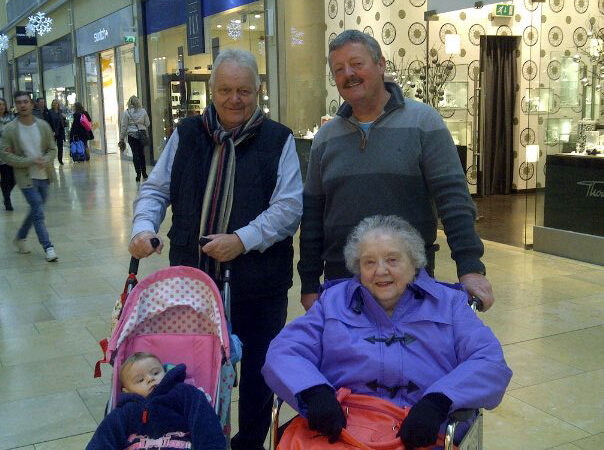 On the way be bumped into an old friend Nigel Moffatt with his daughter Sarah and his mum. He was visiting from Basingstoke. We had a great chat and took some photographs. Nigel’s mum was in a wheelchair and I was tempted to challenge him to a race around St David’s Two. The Barbie puschair has excellent steering and I really fancied my chances…but thought better of it! After saying our goodbyes, we went into the shop. 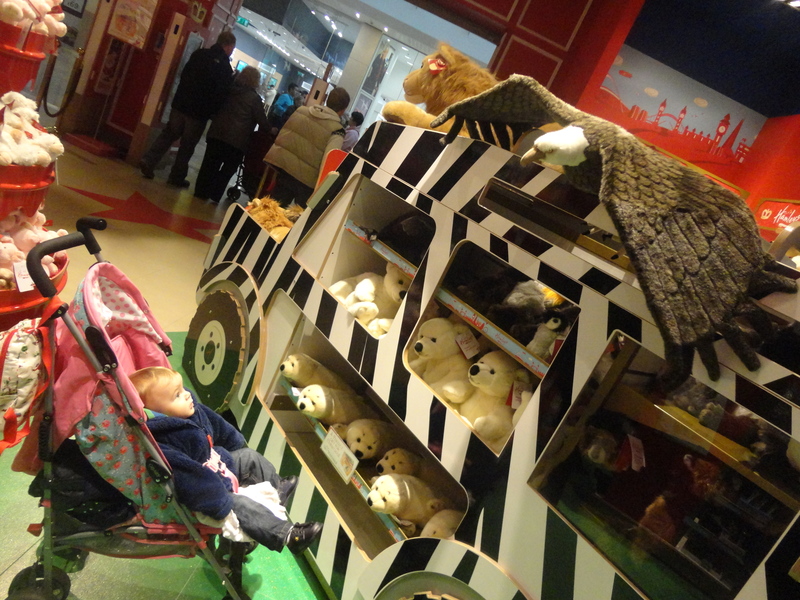 What a paradise for kids is Hamleys! Alfie loved it, especially this toy bird, which was massive, but it reminded me of the seagull, which hovers menacingly over the Hayes Island Snack Bar, so I moved him on quickly. Near the door there was a toy elephant with a price label of £1000. I turned the Barbie pushchair quickly to the right, to avoid Alfie making eye contact with it! After a great look around and with my wallet firmly in my trouser pocket, we headed off for lunch at a familiar haunt, The Café Zest in House of Fraser. We visited here once before and it was good today was even better. It was a bit later than last time, so the ‘Fifty Shades of Grey’ ladies (hair colour not choice of reading material!!) 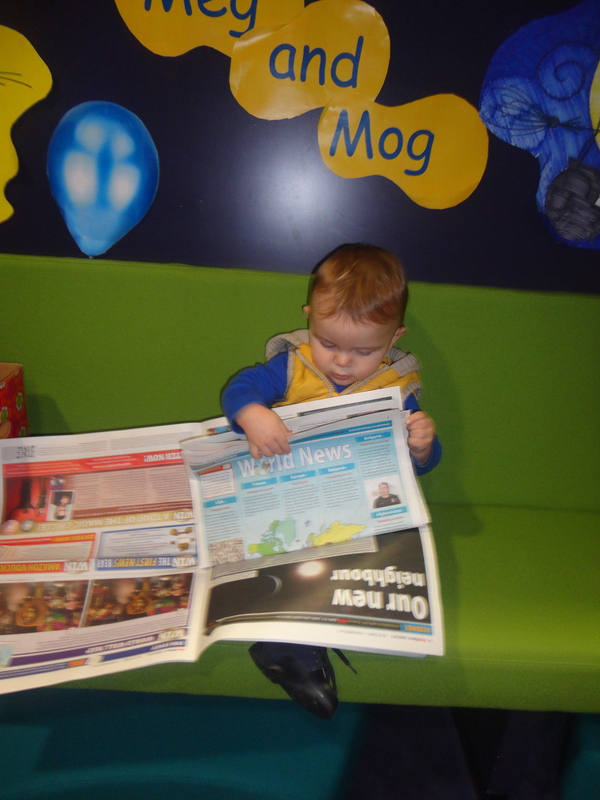 were nowhere to be seen and today the customers were decidedly younger. It was great, not too busy, high chair available and plenty of space. Alfie was happy to be having some food. I ordered my meal – jacket potato with prawns, mayonnaise and salad and a pot of tea. It was a good sign when not only did the tea come in a pot but it came with a little pot of hot water as well – without having to ask! My kind of shop… every time. When I asked a little nervously if they had a microwave to heat my grandson’s meal I was told ‘Of course!’ and the assistant even asked if I would like a china bowl instead of the old plastic one the meal came in. How kind is that? 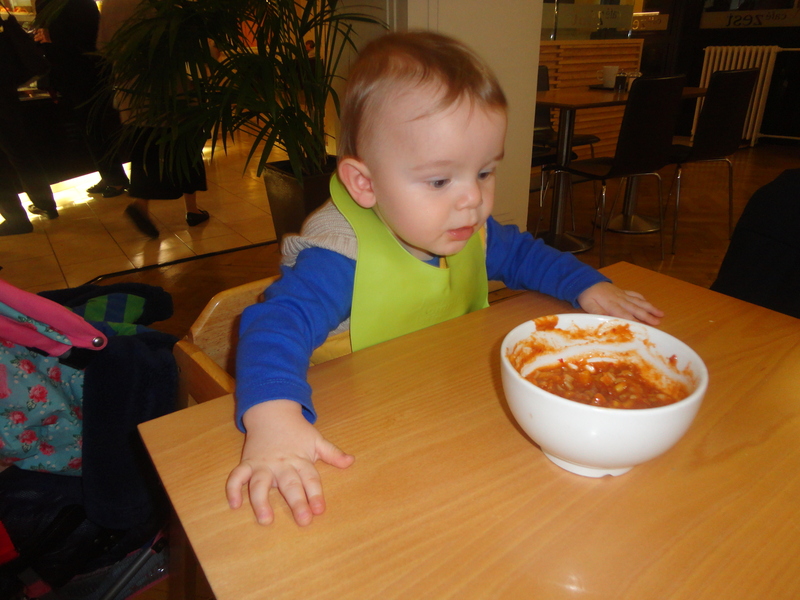 Alfie ate like a king… tender lamb with steamed vegetables followed by rice pudding. They even brought it to my table when it was done and another little lady hovered around me, clearing dishes away whenever one became empty. 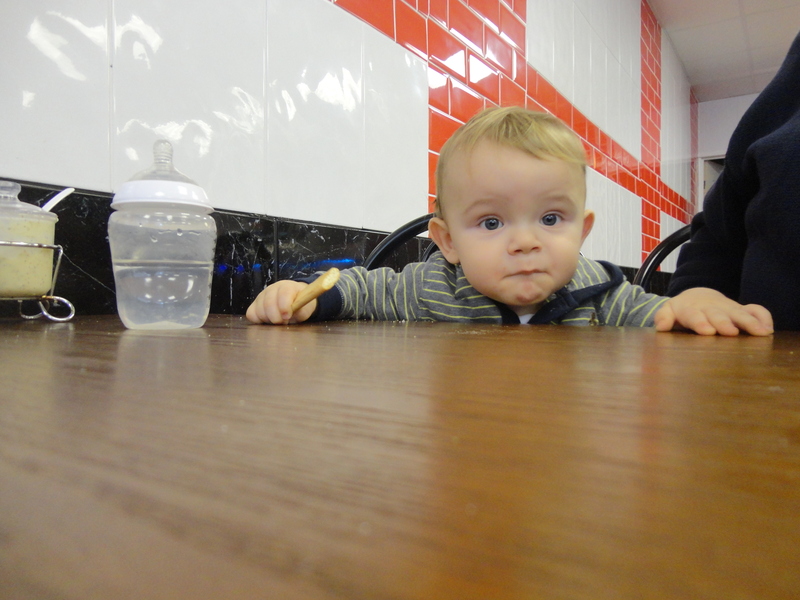 After his meal Alfie played quietly with the lid of his bottle while I demolished the jacket potato. Stunning. A group of five blue haired brigade ladies settled on the next table to us and as usual Alfie charmed them with his smiles and shouts. They made me laugh, as they all ordered a pot of tea and a scone and then halfway through they all decided that the scones were not very nice…so all five went to the counter to complain and all five were given toasted tea cakes in compensation. Funny how all five disliked the scones…turns out they were all from Swansea on a visit…enough said! Alfie waved goodbye, five ‘over sixty’ Swansea Jacks waved back and we made our way back to the station, tired but so very happy. 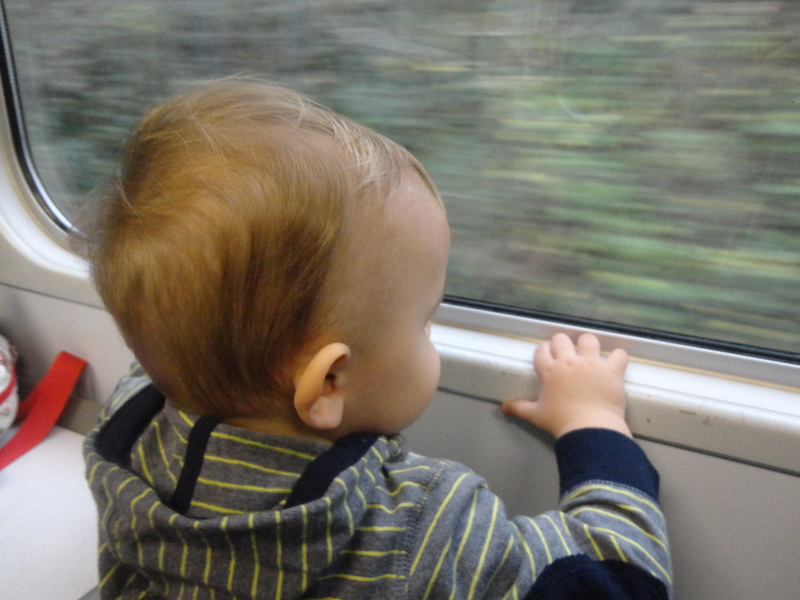 On the return journey the train was quieter, so I got Alfie out of the Barbie pushchair and we looked out of the window together all the way home. He loves to do that…more shouts, more window banging…and more fun! 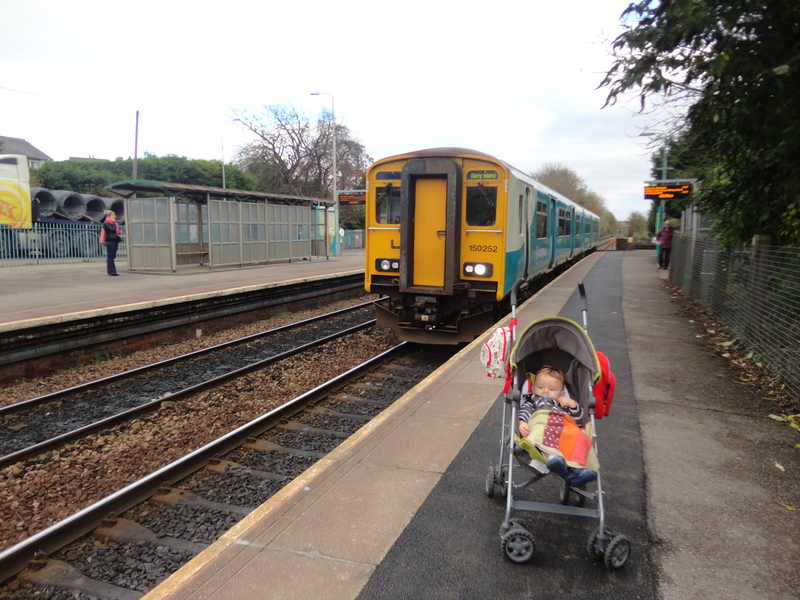 On the return journey we went on one more stop to Dinas Powys Station (Platform 2!! ), as there had been a sighting of Alfie’s Noo Noo (comfort blanket), which he had lost the day before but sadly there was no sign. It was a long walk home and by the time we reached the end of our road the little man was asleep. Did you know it is possible to pick up a little ray of sunshine and place it in a cot and did you also know it is possible to enjoy November? I had a strange dream in the space of time between when I awoke early to make sure Bes was up for work and the time I got up to prepare breakfast and lunch for the lady of the house and then take her to work. I dreamt I was carrying Alfie over the iron bridge that is near our home and I tripped and fell. I cannot remember what happened to the pushchair, Alfie or myself but I am sure it wasn’t pleasant! What was pleasant was remembering when I woke up that it was Friday and Alfie had stayed with us overnight. When this happens the bed beside me is cold as the lady who normally keeps it warm is downstairs watching our little man. In that room which I often think of as a little bit of paradise created by the lady of the house for our grandchildren. It’s a little haven of peace and tranquillity and contains a cot for the babies and a bed for the supervising adult – always the good lady – she loves it and the grandkids love having such a special lady so close. It’s a great idea and a great place to stay – one day soon though as time goes by, the cot will become redundant – unless God send us some more little treasures. Alfie gave me one of his best smiles when he saw me, his whole face lights up and it’s like he’s just about to burst with excitement. I can’t think of many other better ways to start a day. The weather looked OK so we decided to go to Bridgend on the train. This is always a treat. I visited Bridgend some months ago in my pre Alfie days and returned home with a pair of brand new M & S moleskin trousers. I thought I would dig them out and wear them today…just for the fun. 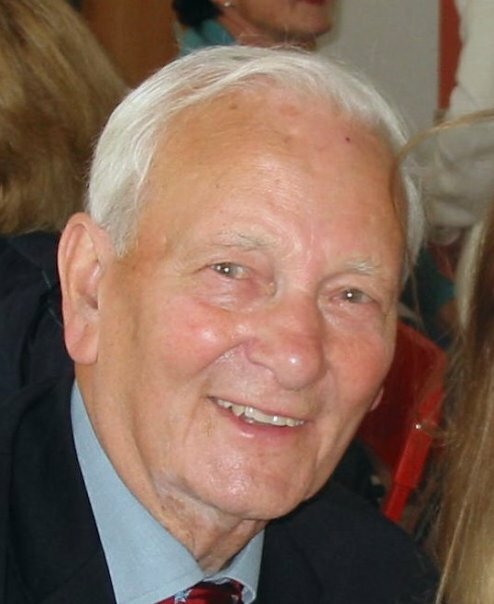 I stopped wearing them a while back because I couldn’t stop feeling them – they are very suede like to touch – and I began to get some strange stares on the train and the bus as I sat there stroking my trousers. I smiled as we left the house as I thought about the fact that I was wearing almost everything bought from a charity shop. The moleskin trousers from The Air Ambulance shop in Bridgend, my jumper from the Red Cross in Penarth and a shirt from Oxfam in Cardiff. Poor Alfie …..going out for the day with this old unshaven guy who looked like he was an ambassador for the United Nations. I needed some cash for the train fare so I decided to walk down to the other end of the village to Dinas Powys station; this had two benefits for me. One, I could get some cash from the machine and secondly I wouldn’t have to carry Alfie in his pushchair up over the iron bridge. In my life dreams often come true! I actually enjoyed the walk, I was tooted several times, I am not sure whether it was some pretty young thing trying to flirt or whether I actually knew them! I waved to several people not having a clue who they were and the one I did know… Sian Jones…I gave an extra big wave. Alfie was enjoying the autumnal breeze on his face as we made our way along. I hate November usually, but today being with our little man, the grey overcast day did have one little ray of sunshine and he was sitting in the pushchair in front of me. We arrived at Dinas Powys station earlier than I had anticipated, so rather than hang about in the cold; we decided to catch the earlier train and change in Barry. First I had to negotiate the reverse of what I dreaded before. The crossing at Dinas Powys station is via an underground passageway, reached by a steep flight of steps down then up the other side. I was very careful. The train came almost immediately and we got on very excitedly. I was annoyed as the ticket collector came for my money just as the train was approaching where the Sully Branch line used to join the main Barry line. I was hoping to investigate and see if there was any evidence left, but when he left me we were approaching Cadoxton. We changed at Barry Town station, scene of one of the best Gavin and Stacey episodes and for me it was a trip down memory lane. For three years when I was in college in Barry I used to catch the train home from Barry every day. In those days it was a proper station with a café with china cups. I loved it. 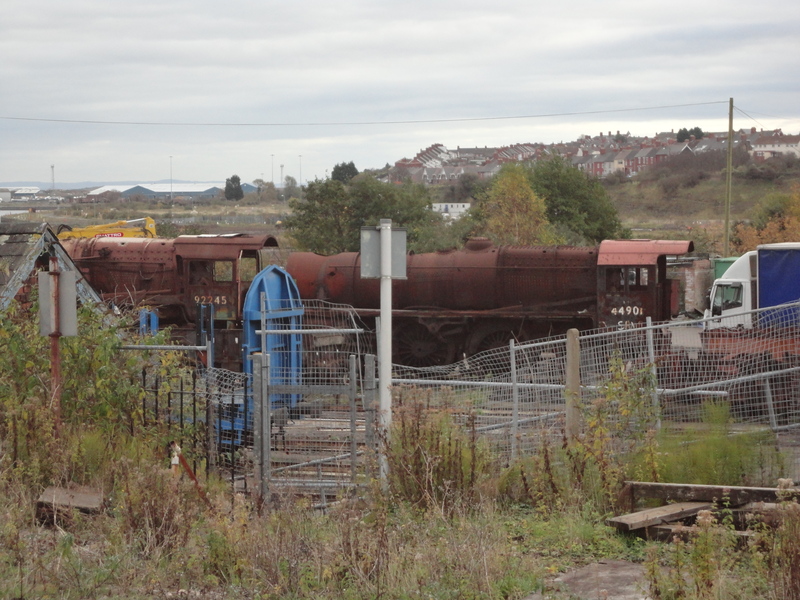 You could gaze over at Woodham’s scrapyard where there were hundreds of rusting steam engines. The rows of redundant steam locomotives were a picturesque sight for holidaymakers travelling to Barry Island, and became a centre for pilgrimage for steam enthusiasts from the emerging steam railway preservation movement. A total of 213 locomotives were ‘rescued’ from Woodham’s yard. Over 100 have been restored to working order. Dai Woodham should be knighted! I often used to sit in lectures and watch the low loaders taking the trains away as they crawled up College Hill. This morning we were able to see two old, rusty, magnificent engines. There is no proper café now just a Mind charity place selling teas and coffee, with a few second hand books. When they move into selling clothes I may give them a visit. 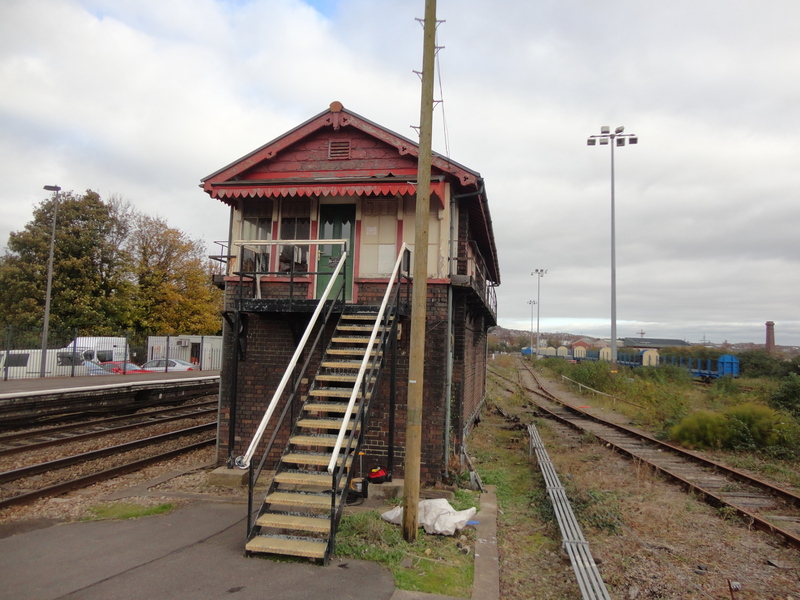 The old signal box is still at the end of the station and I took Alfie to see it. He wasn’t too impressed. It looks like it is used as a mess hut now for the railway workers.I dreamt of how busy it would have been years ago. 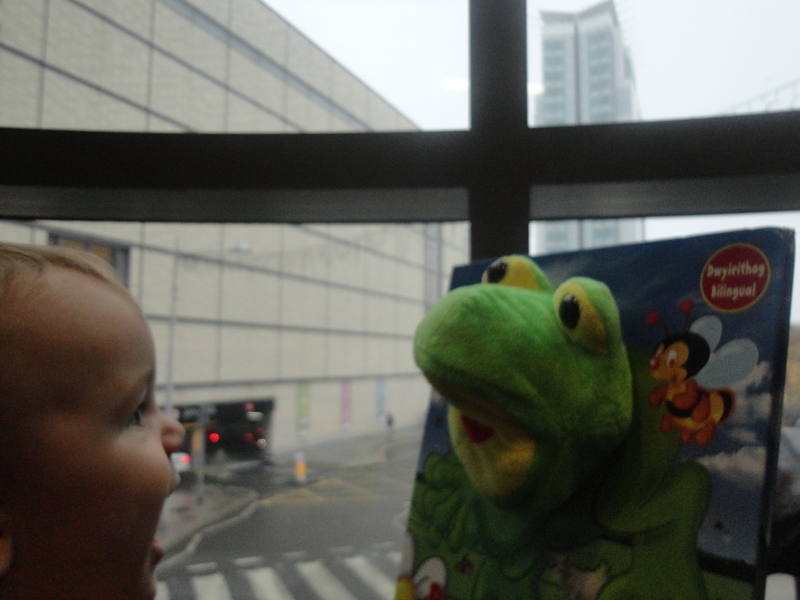 Alfie and I watched a plane flying low overhead coming into land at Cardiff Airport…he enjoyed that! Our train came in and we got on. 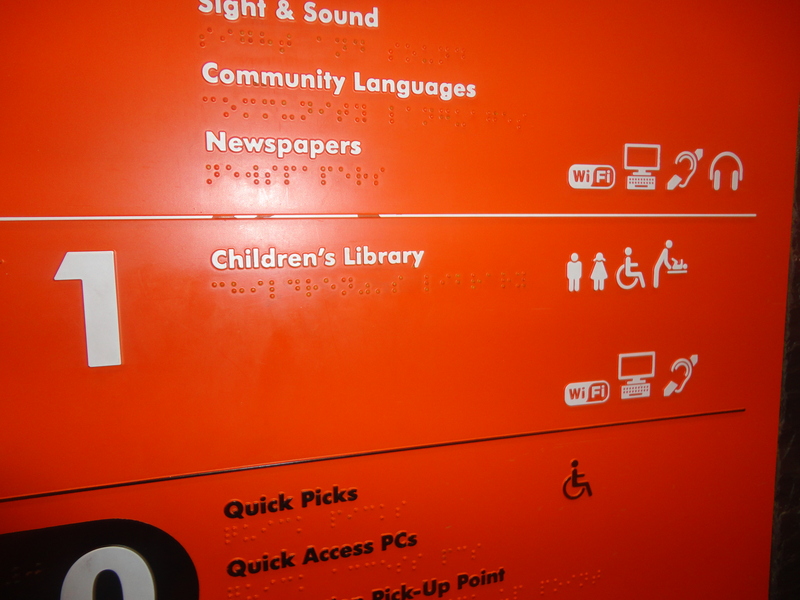 Annoyingly three things happened – firstly, the train had no tables so I had to sit down the end in the part where people can put their bicycles, secondly there was a bike already there, which meant a squeeze for Alfie’s pushchair and the owner of the bike was smelling to high heaven. I was gagging. Thirdly, Alfie fell asleep! I was just about to explain all about this line running through the heart of The Vale of Glamorgan and he was away dreaming of the steam engines at Barry! The old Barry-Bridgend passenger service finished on 13 June 1964 as part of the Beeching cuts, but passenger trains on the eastern part of the line from Cardiff to Barry continued, and the western section continued to be used by through passenger trains between Cardiff and Bridgend when the main line via Pontyclun was closed. This still frequently happens at night and on Sundays and train operators often run empty coaching stock and empty mail trains via this route to retain train crew route knowledge. The scheme to re-open the line was promoted by the Vale of Glamorgan and Bridgend Borough Councils to the Welsh Assembly Government in August 1999. 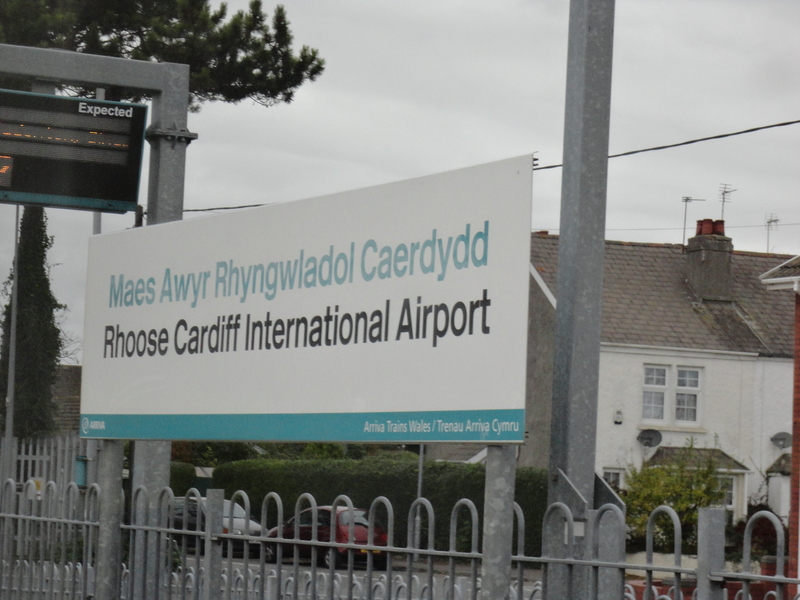 New stations were built at Rhoose, Cardiff International Airport and Llantwit Major. At Bridgend, the Barry Bay was re-laid and a new platform built. The section of line between Barry and Bridgend reopened for passenger services on 12 June 2005. It’s such an interesting ride. The train leaves Barry station and instead of the sharp turn left towards Barry Island it goes straight on and passes Romilly Park. I think all visitors to Barry should come in this way. The West end is the best end and has many impressive houses edging the park. I checked Alfie he was still fast asleep. After this it crosses the Porthkerry Viaduct with wonderful views out across the Bristol Channel. The next stop is Rhoose Cardiff International Airport. It’s a hoot…no expensive facilities here, just a small platform and a coach waiting to take passengers to the Airport to be jetted off to some far flung destination. The coach driver was asleep just like Alfie. He must have the world’s most boring job… I’ve never seen a passenger use it! After Rhoose Cardiff International Airport the train runs along the coast. The sun had come out and the channel was like a silver ribbon glinting in the Autumn sunshine. We passed Fontygary Bay, RAF St Athan – sadly no jet fighters here any more. I used to love it when they flew down low over the camp at Boverton when we took schools there. You could feel the heat off the engines and the noise was deafening. We all loved it! After St Athan it leaves the edge of the coasts it nears Llantwit Major and then makes its way towards Bridgend. The Vale of Glamorgan is a beautiful place to live and this train ride is a great opportunity to see it in all its glory. I checked Alfie… still sleeping! Thankfully my smelly travelling companion left the train at Llantwit Major and took his bike with him. When we arrived in Bridgend, I remembered the place with little affection it, it makes Barry seem like Monte Carlo. The sun had disappeared as I walked down Station Hill, I made a note… going down was fine but the walk back up may need some extra time. Bridgend has what most towns seem to have these days, an Eastern European Accordion player, a few Big Issue Sellers and a growing number of charity shops. The accordion player woke Alfie up. He was sitting outside the Air Ambulance Shop. I had a few coins in my pocket and as I thought about giving him a few, I remembered the moleskin trousers and the prospect of finding a moleskin jacket or a moleskin pair of pants or a moleskin hat to go with them proved too much. Despite the very pleasant playing and a cheery ‘Dobry wieczor’ I kept my hands… and my coins in my pocket. Nothing! We left the shop with long faces. I thought Alfie might like the market next so we made our way there. It was OK, but it wasn’t too special…no fish stall or animals or even pig heads and ox hearts…Cardiff is so much better. 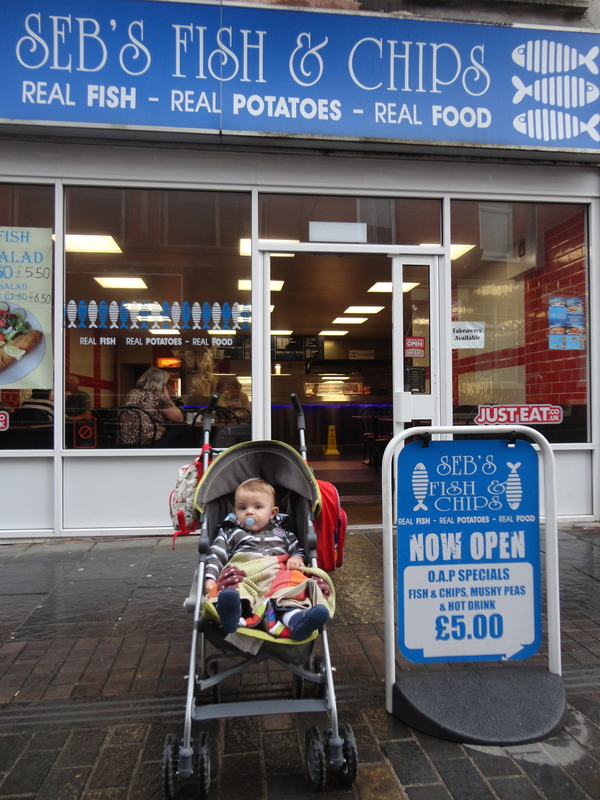 SEBS Fish and Chip Café. Bridgend can do one thing right. We headed there and I ordered my usual OAP special fish and chips, mushy peas and a hot drink. Bliss! They had no high chair so Alfie had to sit on my knee and eat his Hovis sandwiches with mature grated cheese, a fruit pot and some biscuits. 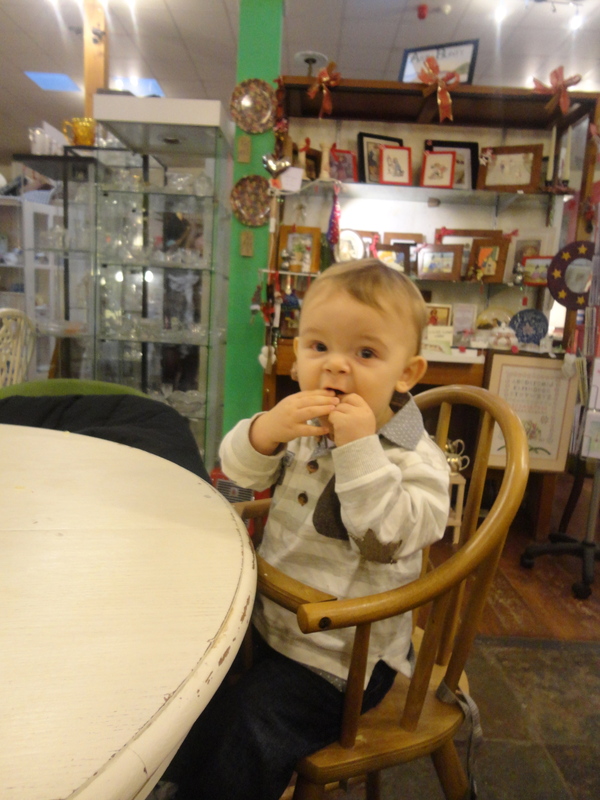 He was ever so good and ate quietly and happily amusing all the other customers with his smiles and occasional shouts. He is trying so hard to talk and it’s hilarious. There was another family close by, a mum with her daughter both very overweight, who had two monstrous kids. Alfie though was superb. The café was full of interesting people. An elderly couple who came in holding hands, another couple him small and mousey looking, her very overweight with a tiger print top and she kept looking and smiling at Alfie. On the other side, a young lady, on her own, who looked like she had the weight of the world on her shoulders. I will never know her, but I wish her well. Alfie sat on the seat next to me eating his biscuits, while I tucked into my fish and chips. He enjoyed sharing my mushy peas and we just enjoyed being in each other’s company. After SEBS we had a little walk around before attempting station Hill; Alfie loved it but I struggled a bit and pretended to stop and look at the view at regular intervals. When we got on the train we found a table seat and prepared for the journey home. Alfie loved it! I was so pleased! He got excited as the train began to pull out. He had been watching a big old raven hopping along the platform, which flew up as the train pulled out. He loved the trees, the fields, the sheep, and the horses. He banged the window and shouted. It was magical. 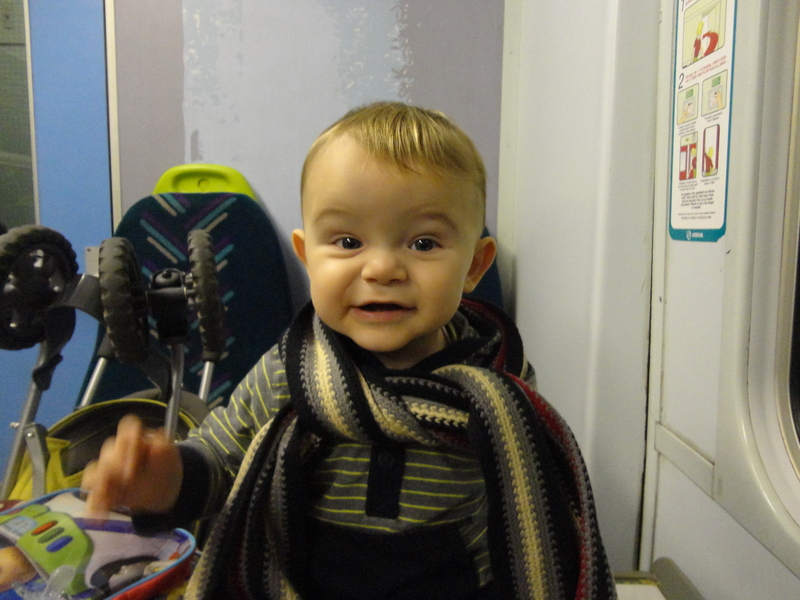 If this little lad grows up loving train rides, he will have one happy grampy! I watched his eyes as the train raced along they were flickering from side to side, trying to take it all in. He loved the sea as we neared Fontygary. The journey back, all fifty minutes, went by far too quickly and we soon arrived back home. No iron bridges to cross this time, so we slowly made our way back up our little Close. Alfie wasn’t tired when we got back and as his dad was off playing football, we had an extra hour or two to enjoy playing together. 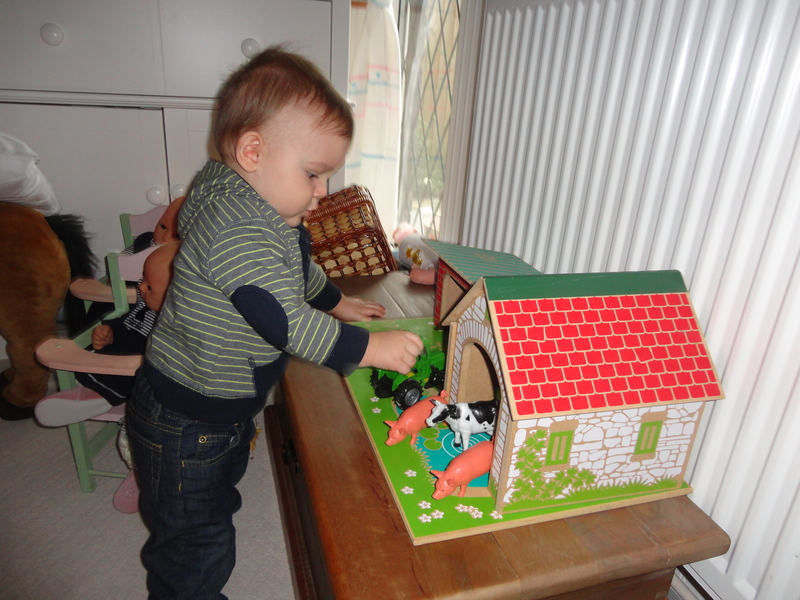 The farmyard caught his eye and we played ‘farms’ until his eyes started getting heavy. Some real farmyard smells prompted me to change his nappy before settling him down for a little snooze before mum came to pick him up. I watched him sleeping, my day had started with a bad dream but we had a lovely time together and I found myself humming an old John Denver song, funny how old songs come back into your mind at a time you are not expecting them…. Welcome to this crazy place. I will teach you to fly on the wings of my love. 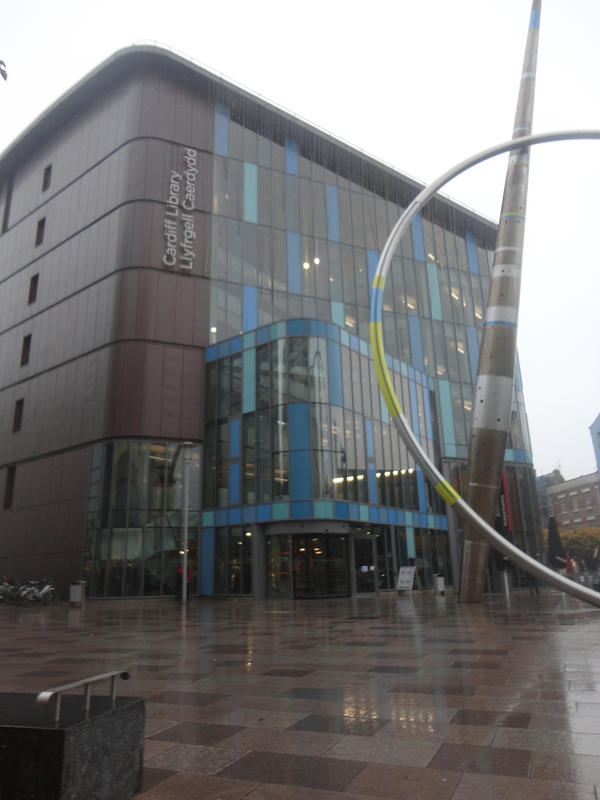 After the seagull last week, I thought I would give Cardiff a miss and head west. I have always wanted to catch the train to Bridgend going down the Vale of Glamorgan line through Rhoose and Llantwit Major. It was pretty cool as well . I had to decide whether to use my Senior Railcard or my Valley Lines Seniors card…I settled on the latter…only cost me three quid. The ride was good; instead on turning left towards Barry Island the train went straight, past Romilly Park in Barry, then on past Porthkerry Park. Going across the Porthkerry Viaduct was awesome and fulfilled a lifelong ambition. The Rhoose/Cardiff International Airport station made me smile, it was tiny, although there was a bus ready to whisk passengers off to the terminal and sunny destinations across the world……except there were no airport passengers on the train.The journey past Rhoose followed the coast for a while going past Fontygary and Aberthaw, then cut inland at St Athan before heading down through the Vale…. it was really good. Bridgend was FREEZING and a slightly seedy little town, so I had a little look around before heading for a proper old fashioned fish and chip cafe, where I ordered an OAPs lunchtime special..fish, chips, mushy peas and a massive cup of tea for a fiver.I guess I’m 3 years 8 months too young really, but I am a pensioner so I thought I would bluff it. I put my glasses on the end of my nose, looking at the menu, acted a bit doddery and asked for the OAP special. I thought…well if people are starting to stand up for me on the bus I deserve it. I did look around for any seagulls before tucking in! 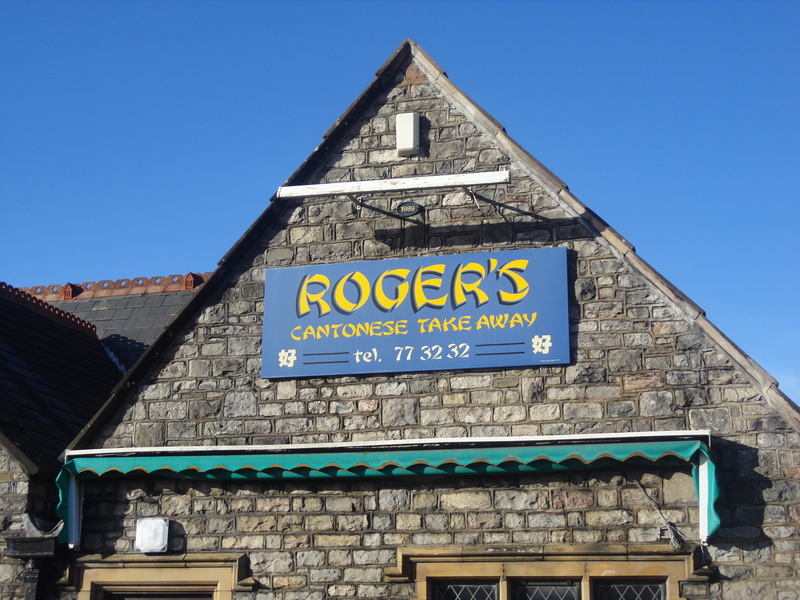 It was the nicest fish and chips I have tasted for many a long year. Pure class! Before heading home I purchased a brand new pair of black moleskin M & S trousers in the Air Ambulance charity shop. I asked the old duck behind the counter did any moles have to suffer in the making of these trousers and she replied that she wasn’t really sure. I’m wearing them at the moment…they fitted perfectly and I can’t stop feeling them. To be honest I’m not really sure what moleskin is. I hate animal cruelty but those moles are such a nuisance digging up everybody’s lawns…so maybe these trousers mean it’s payback time. I’ll have to give The Wind in the Willows a wide berth for a while….